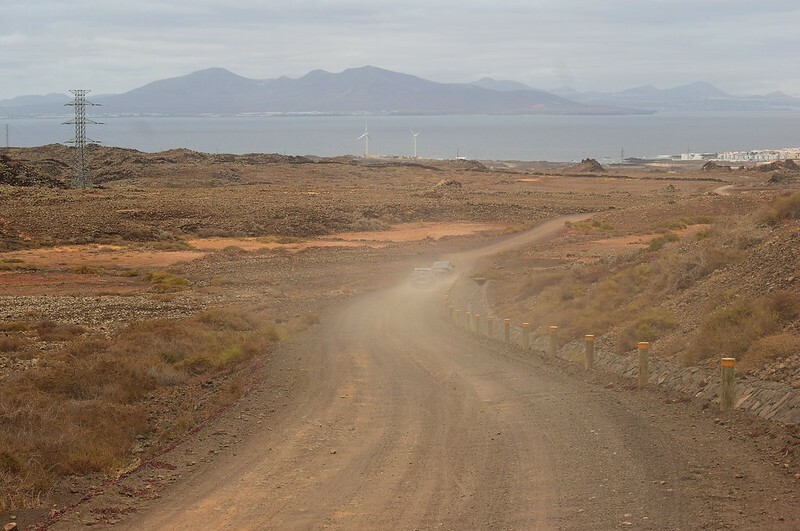 Time for another cheap break in the Canary Islands like we did 3 years ago when staying in Playa Blanca, Lanzarote. 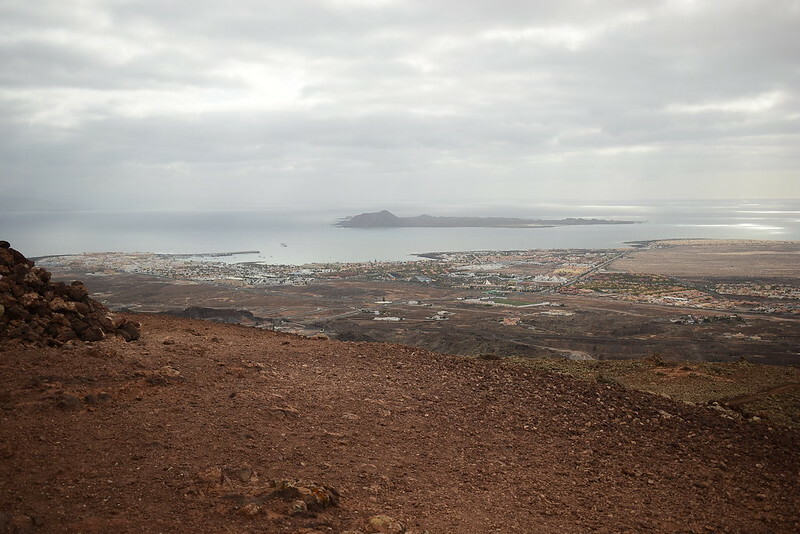 This time, the destination was across the water at Corralejo in the north of Fuerteventura and i'd get to enjoy a view of Hacha Grande for the whole week knowing I had sat up there a few years back. 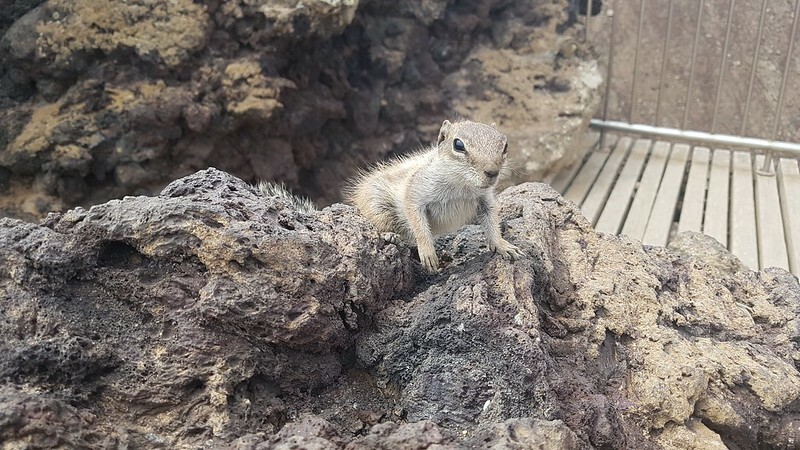 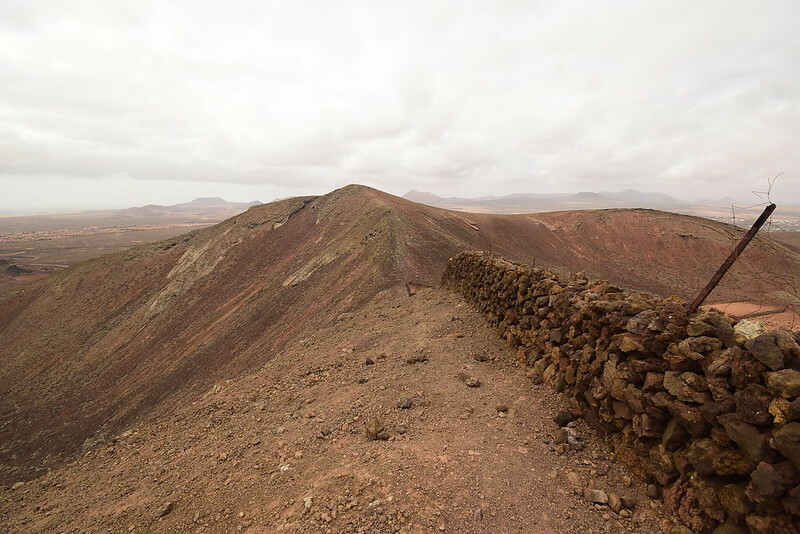 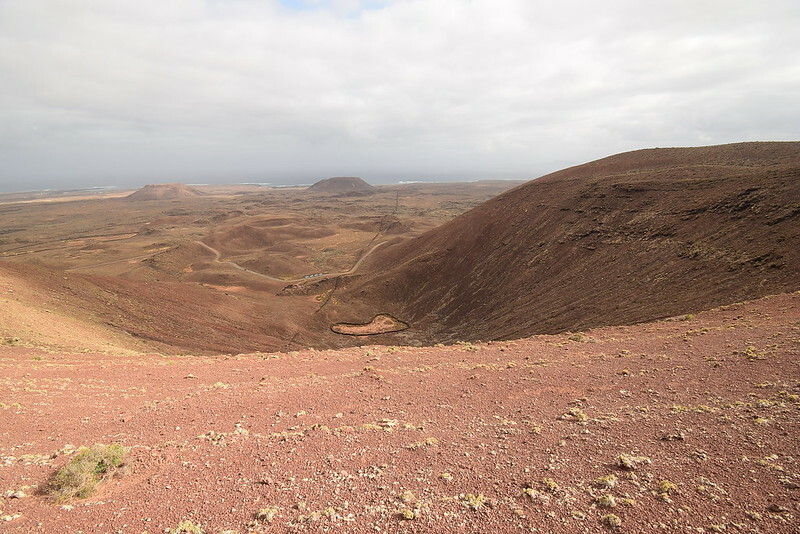 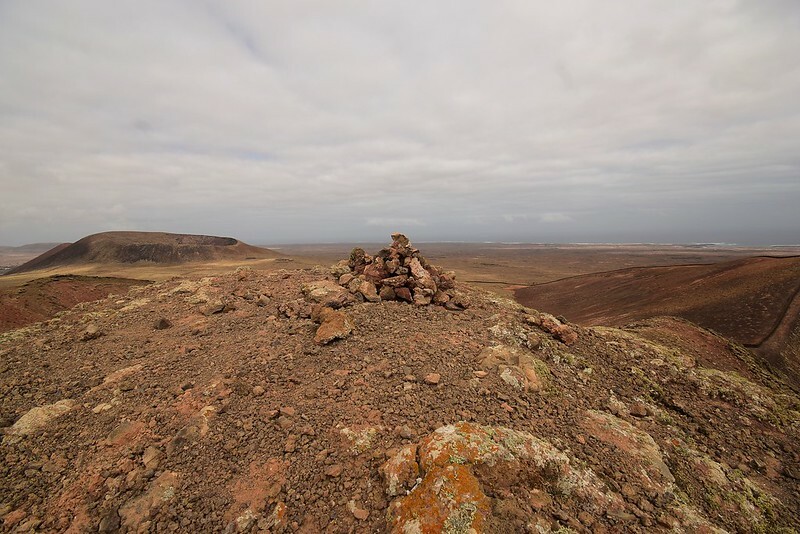 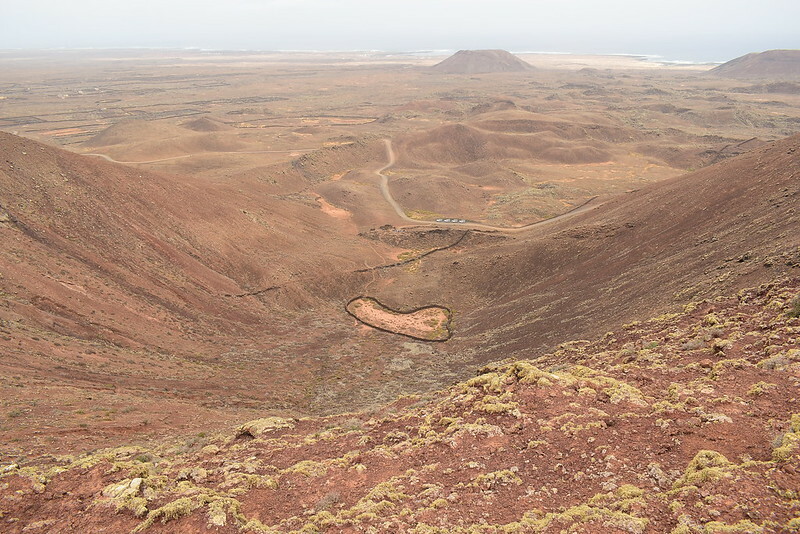 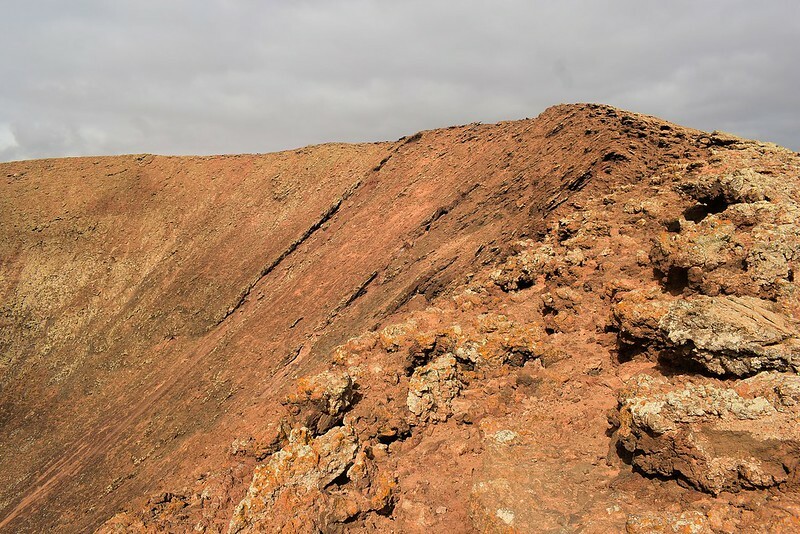 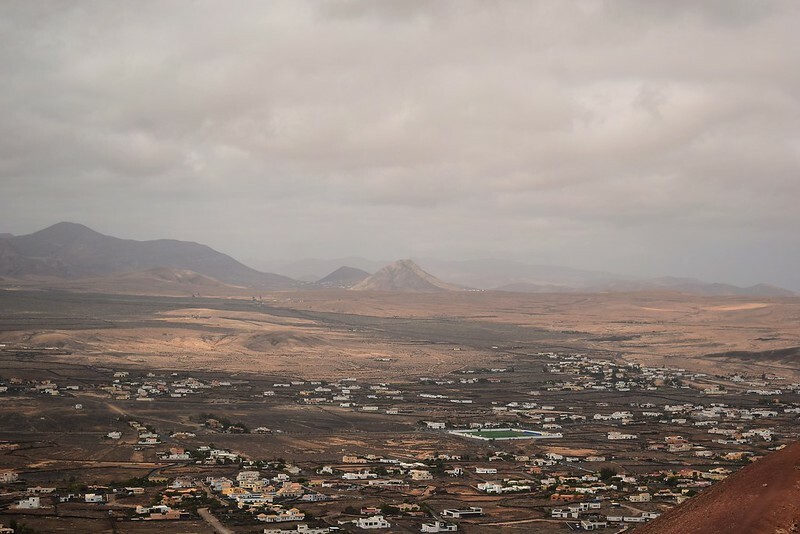 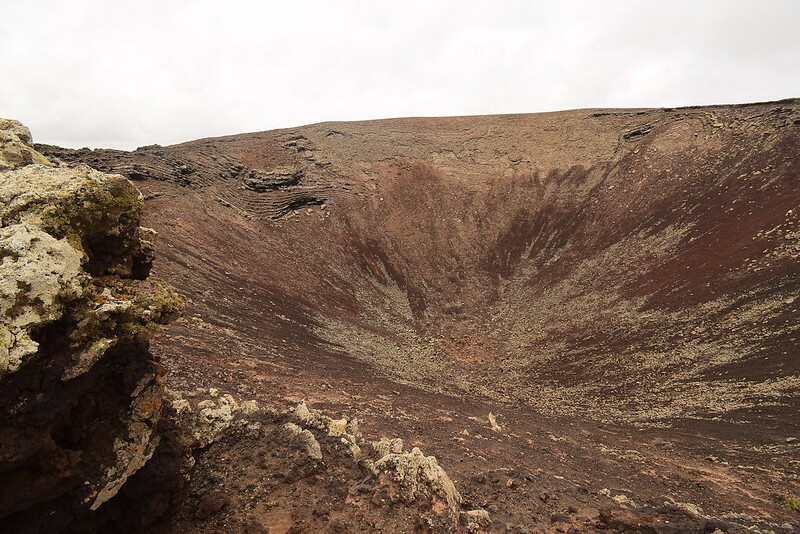 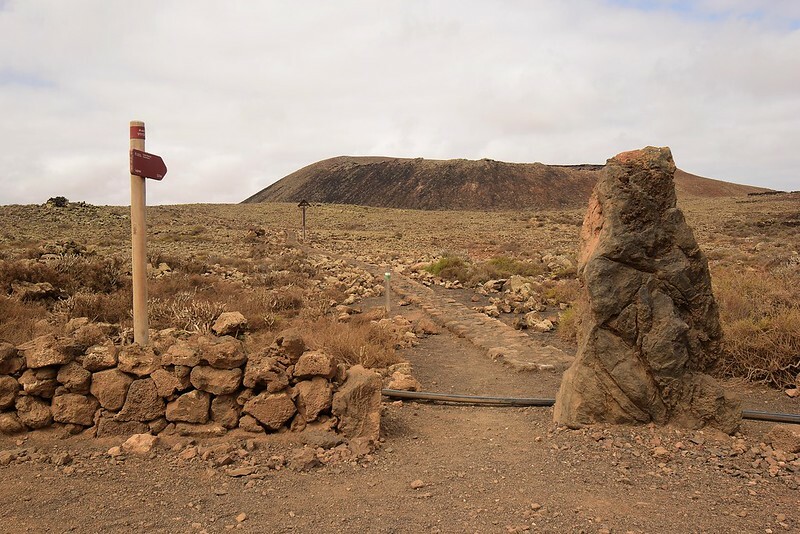 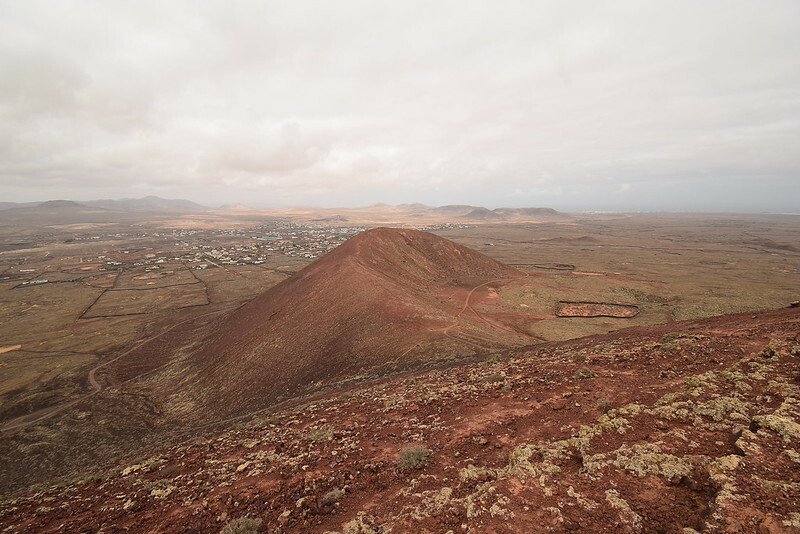 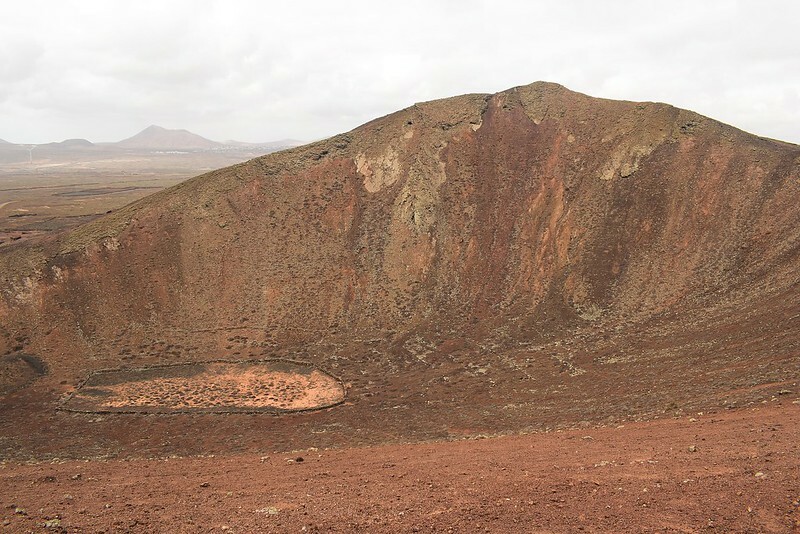 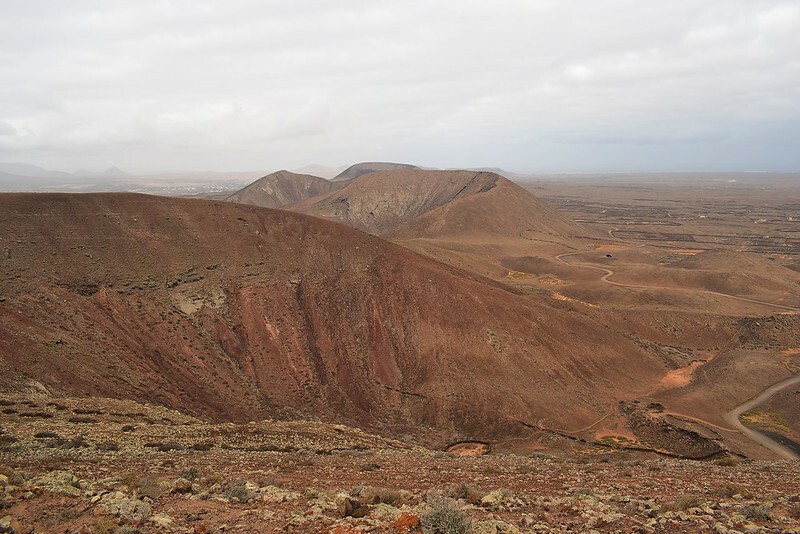 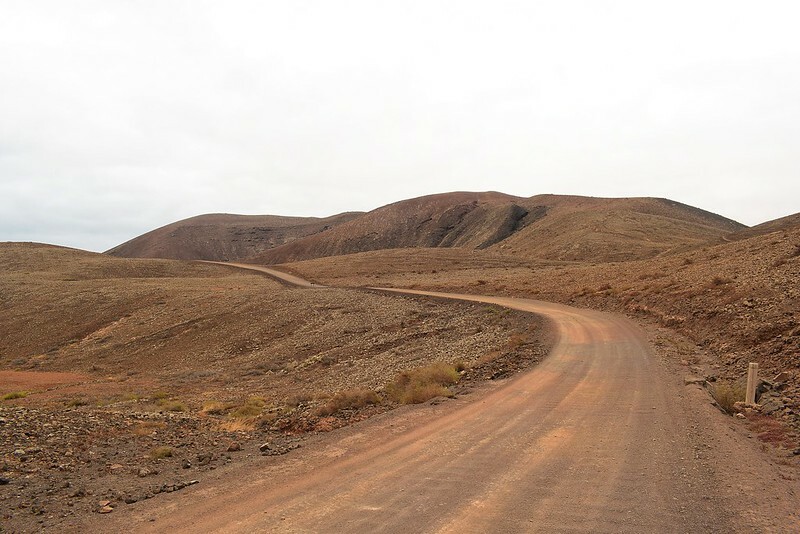 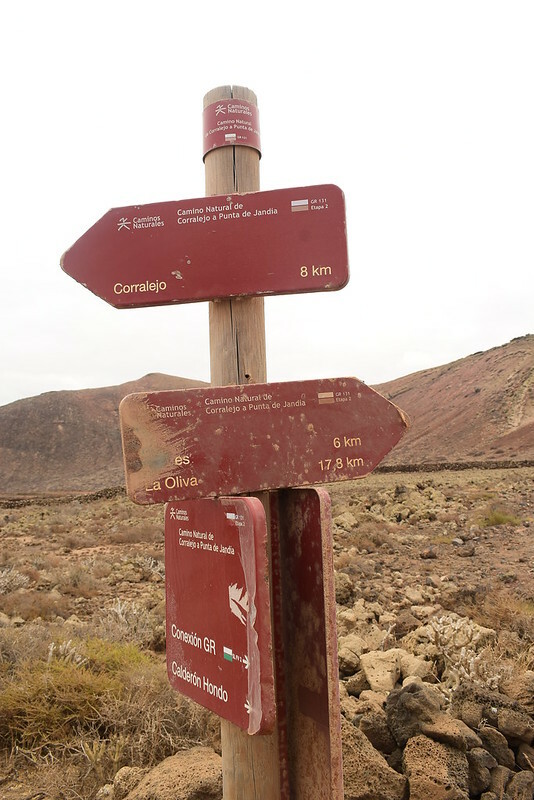 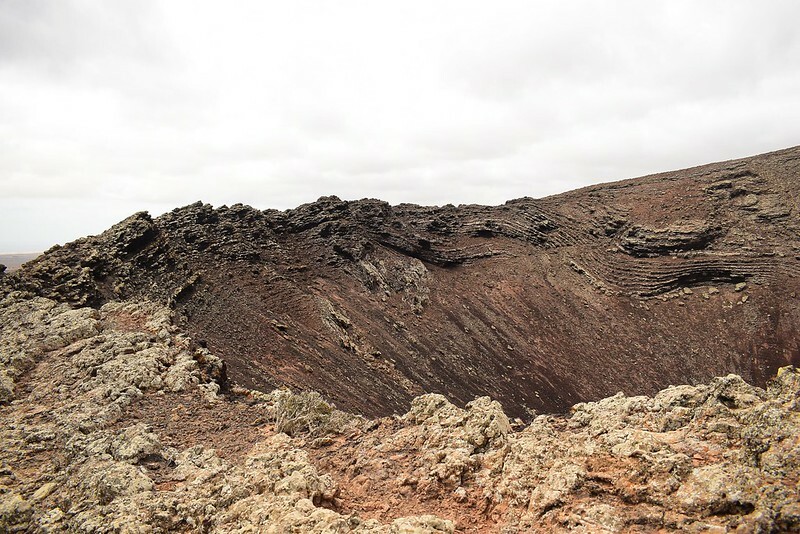 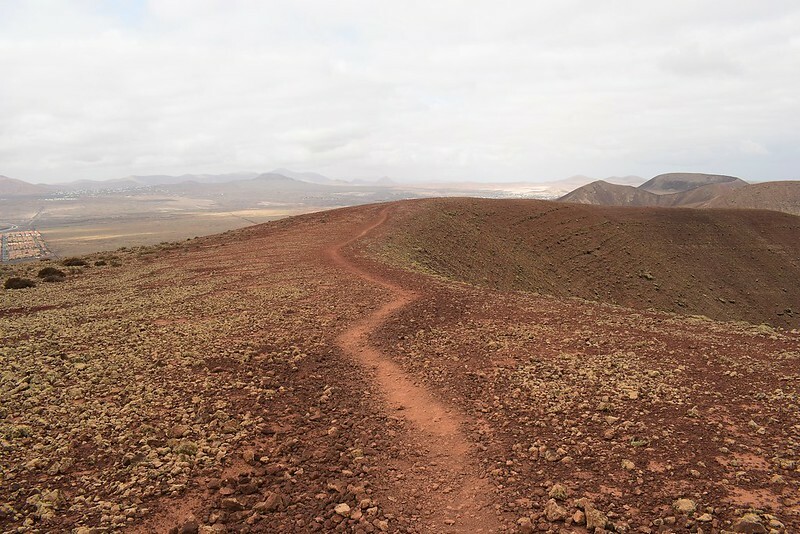 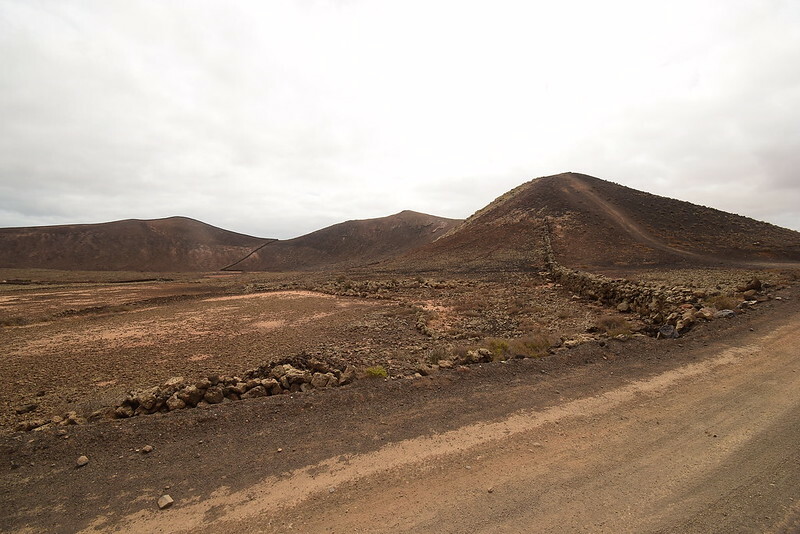 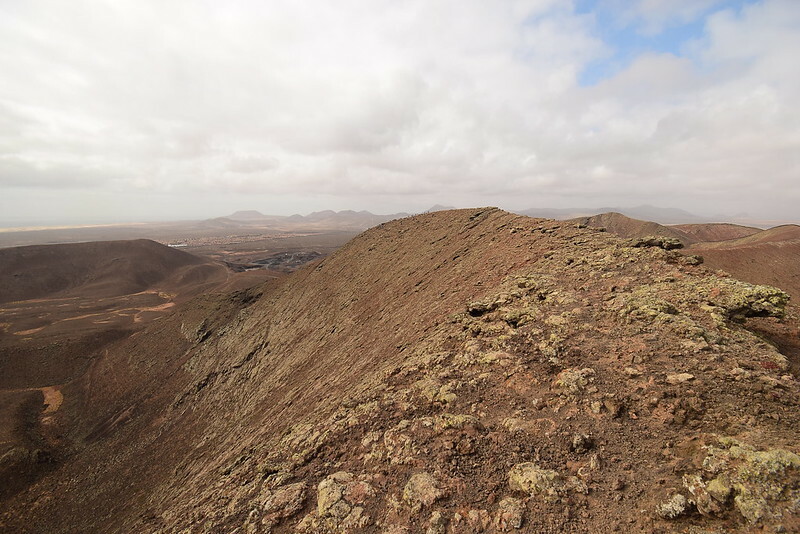 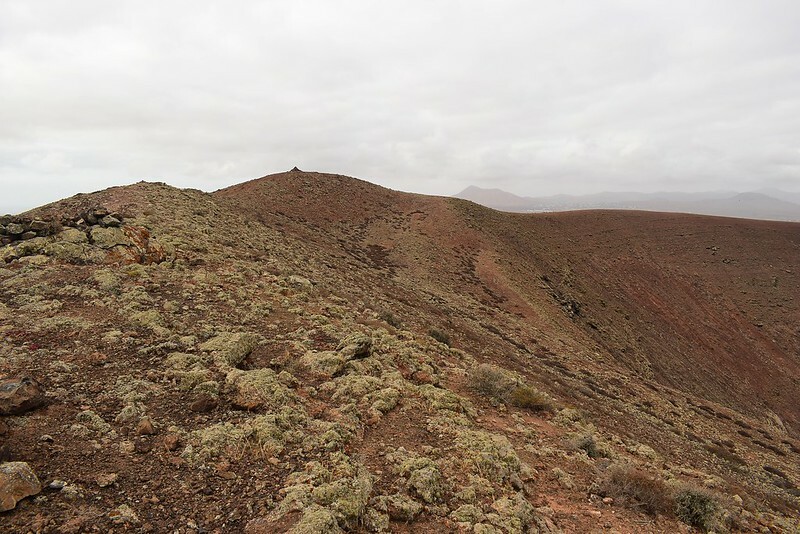 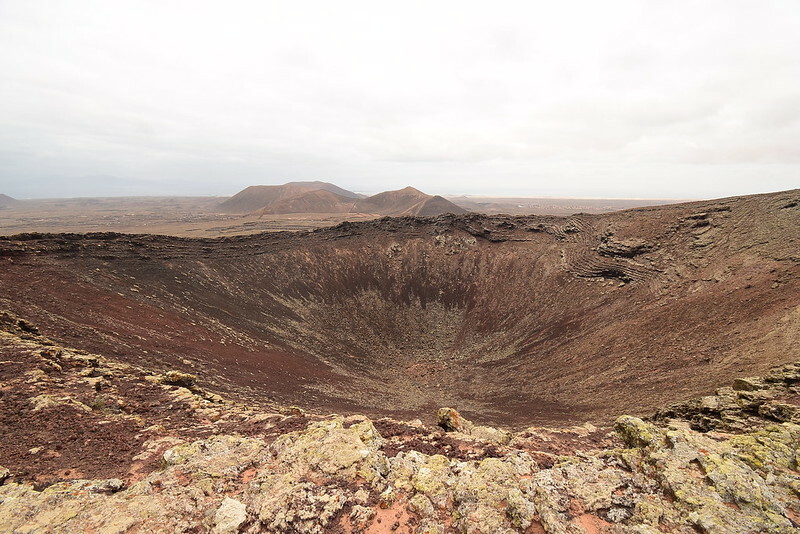 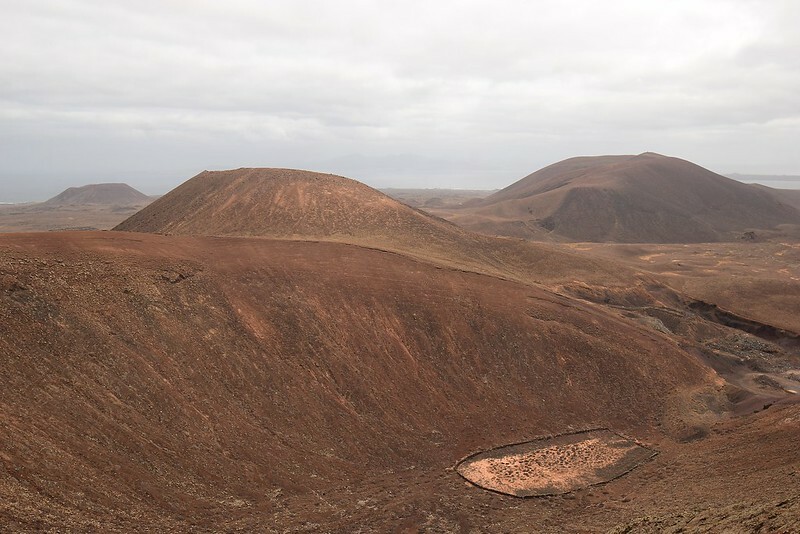 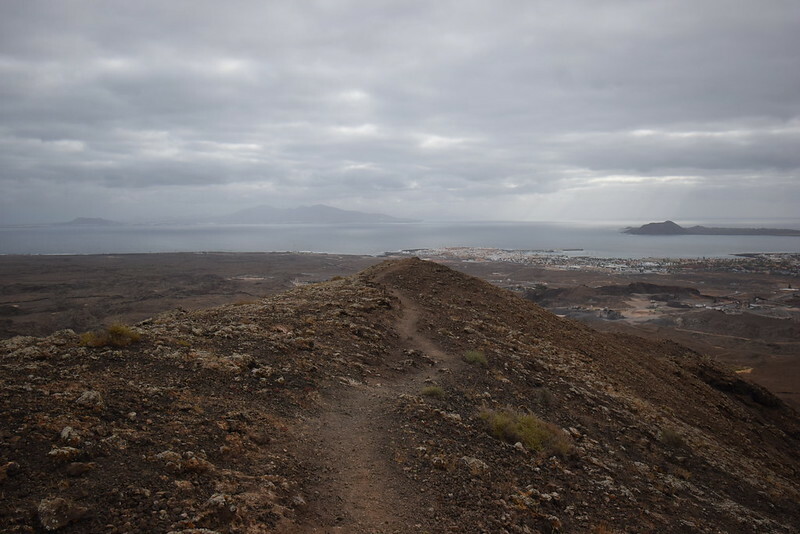 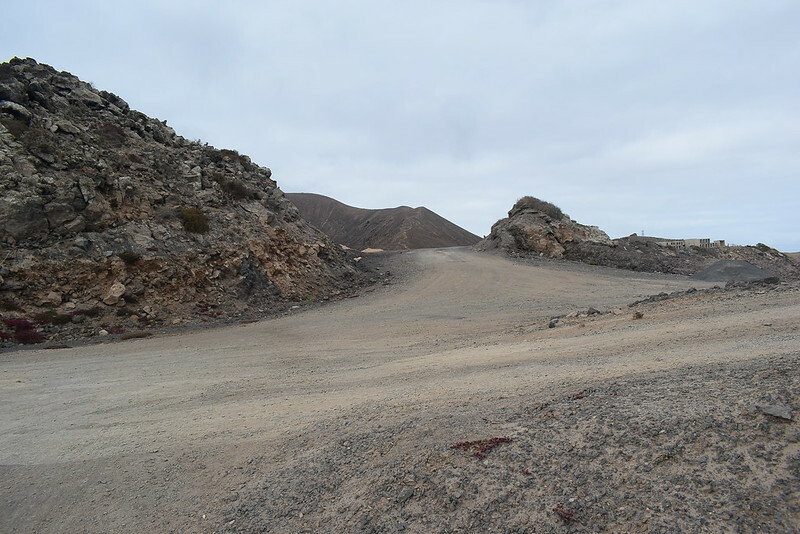 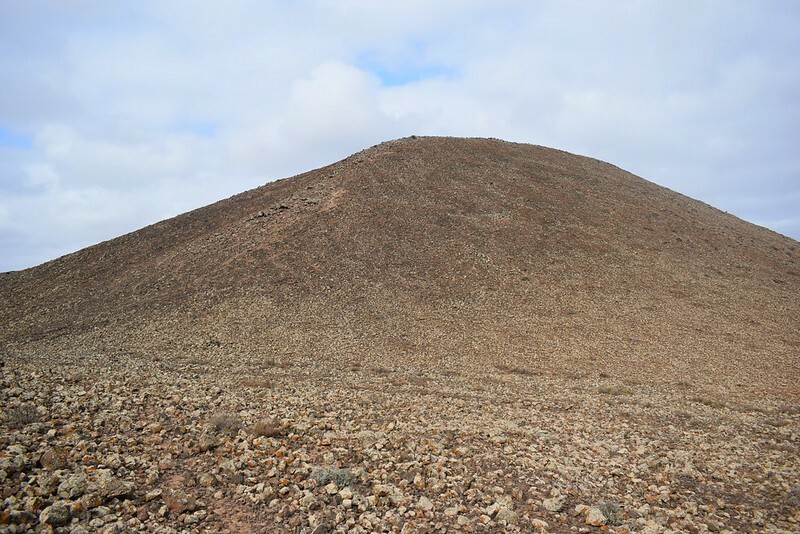 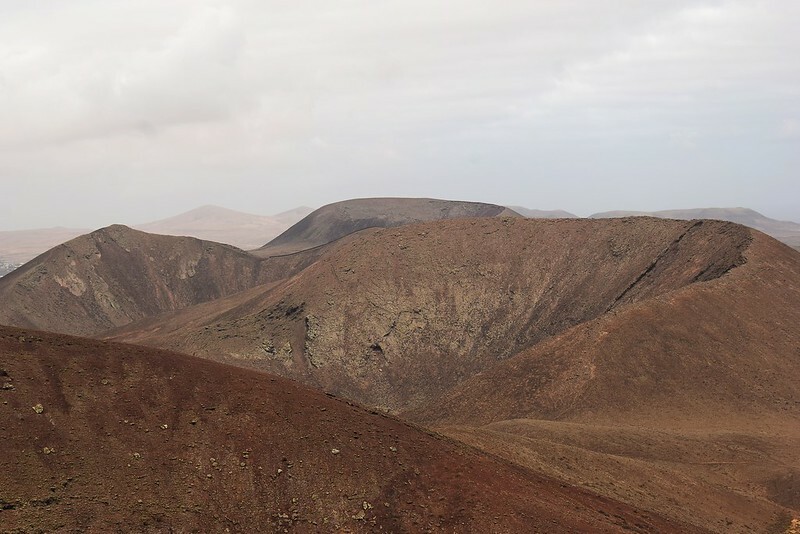 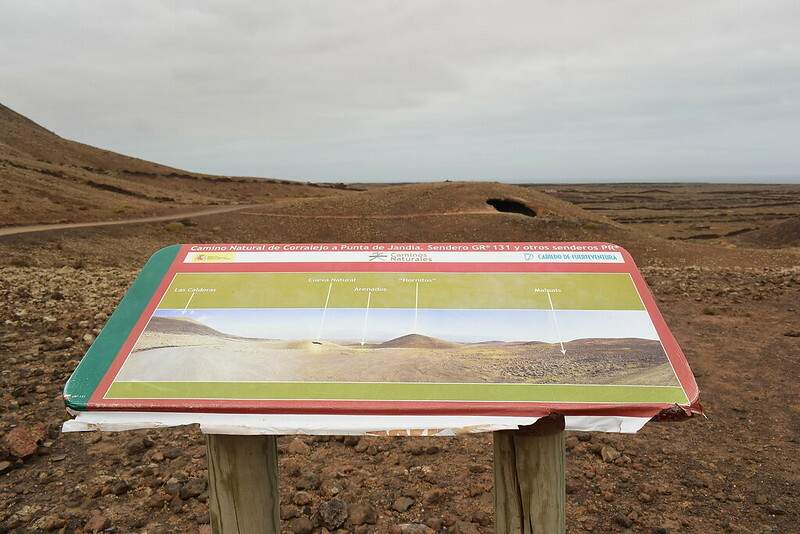 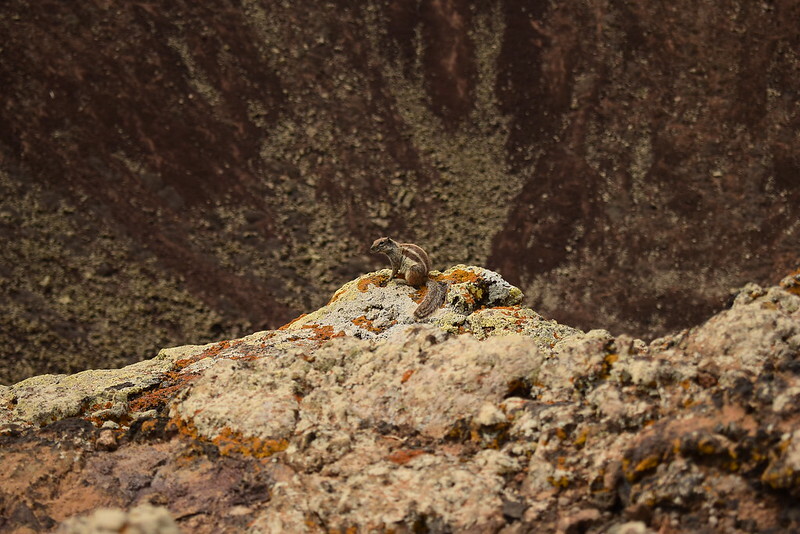 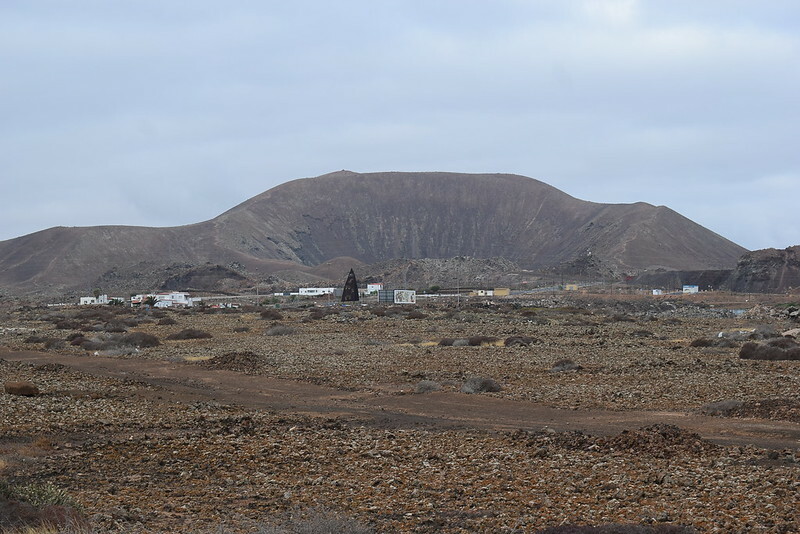 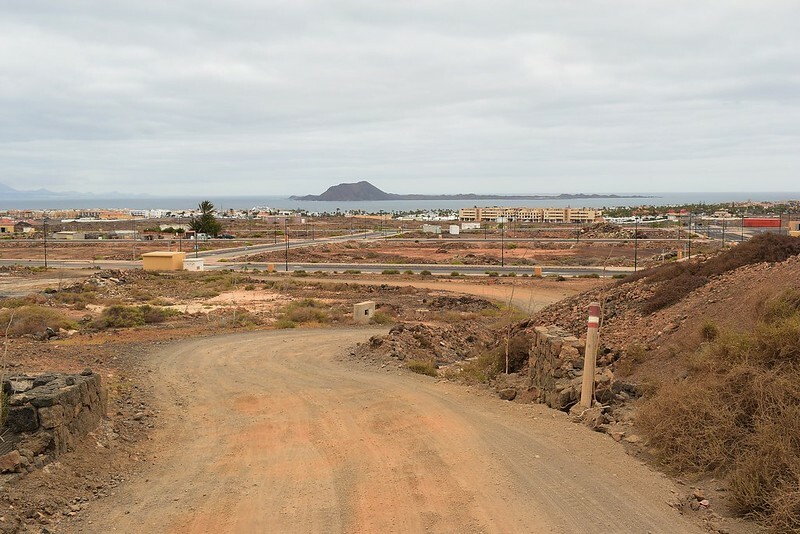 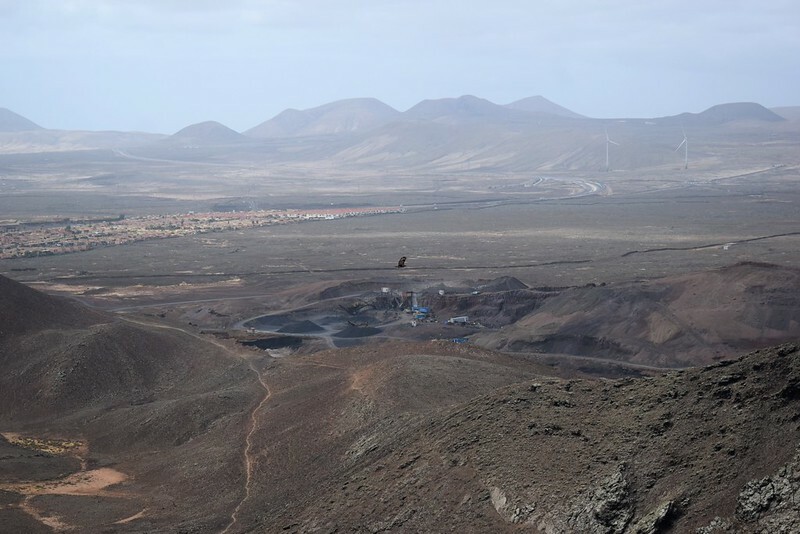 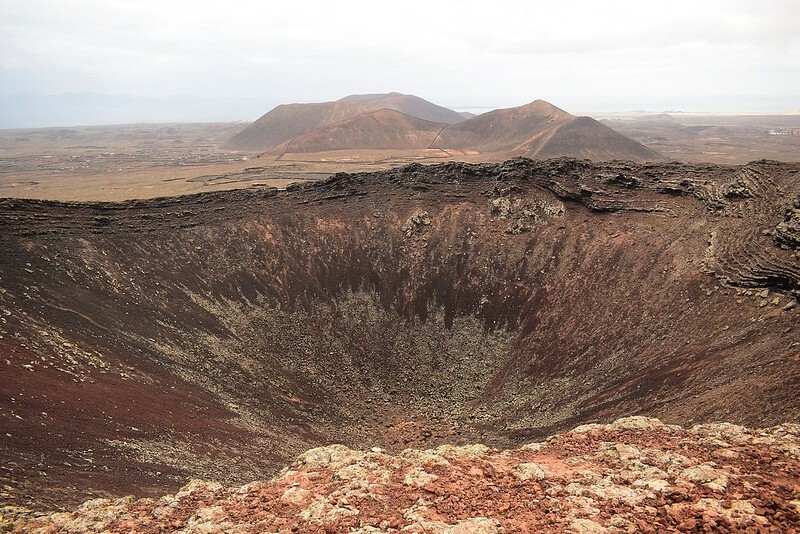 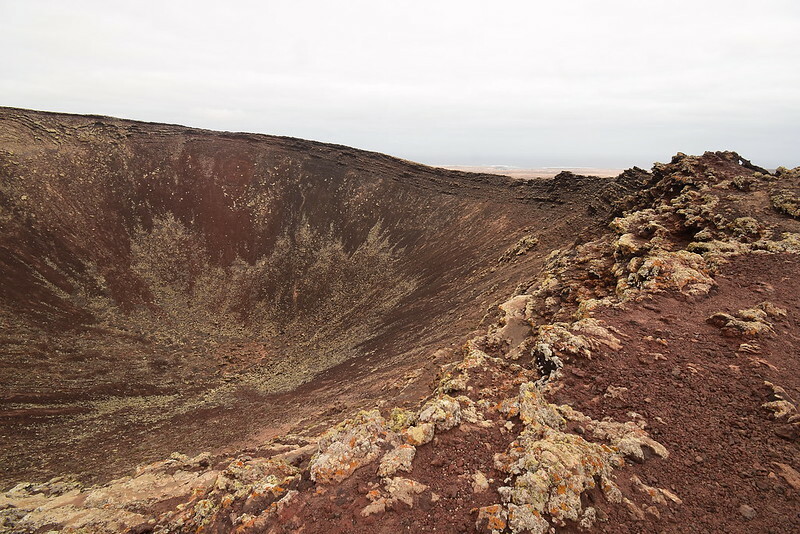 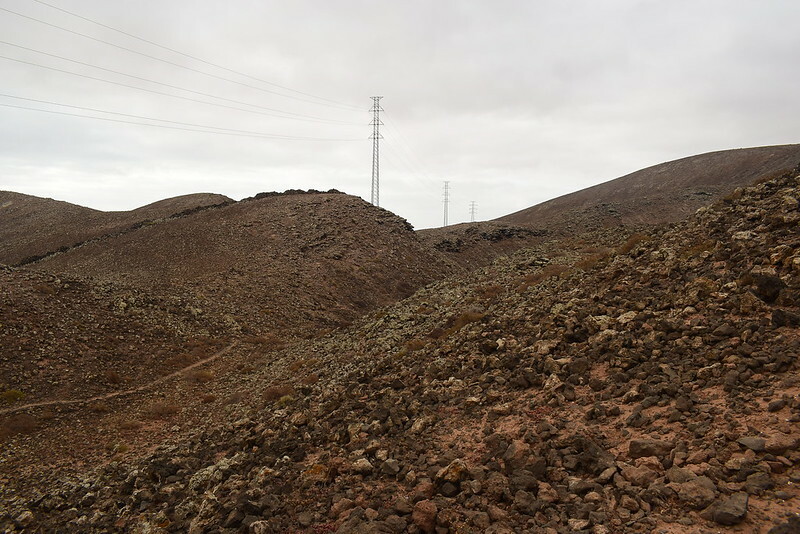 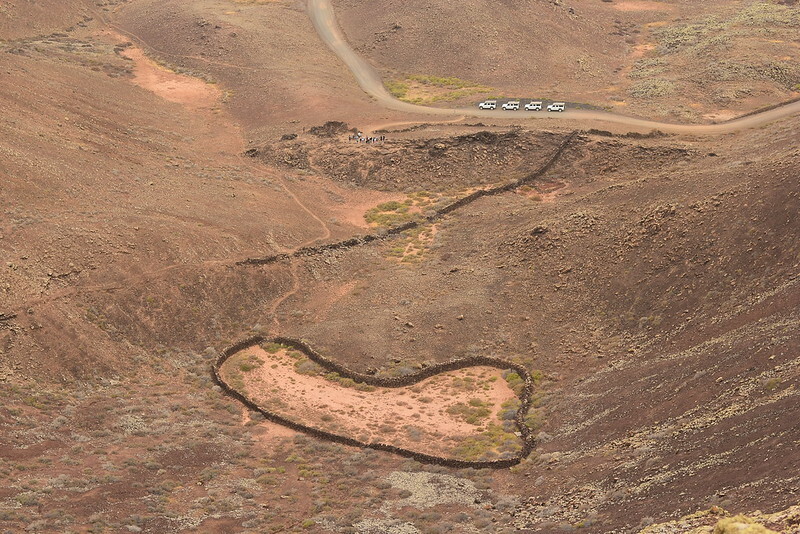 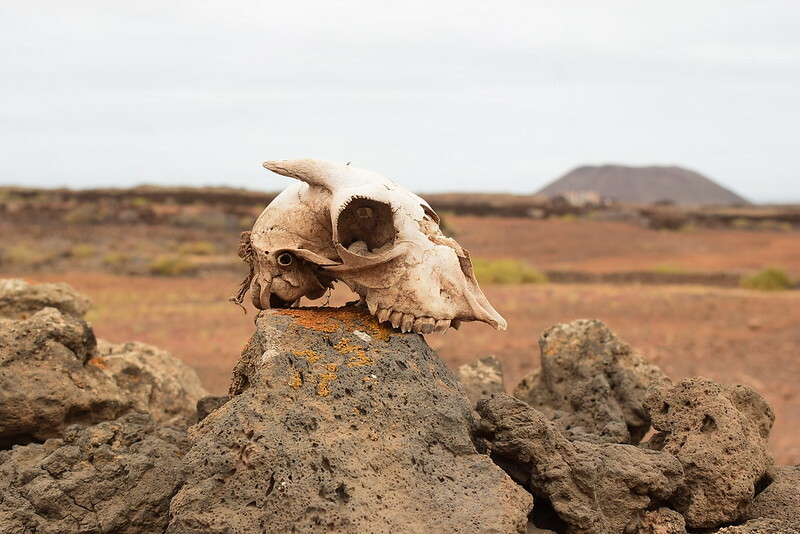 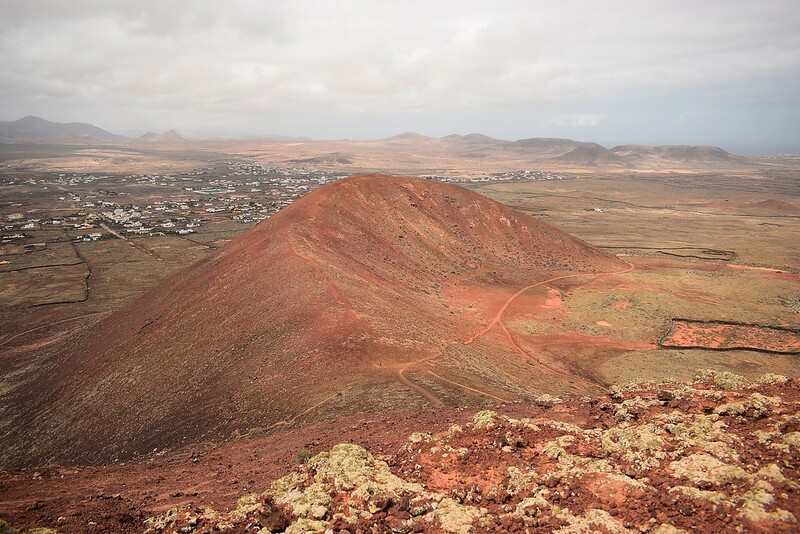 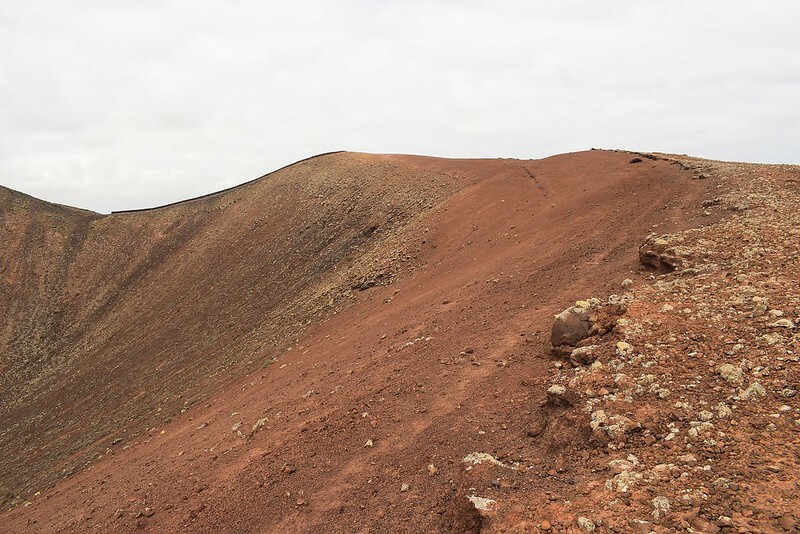 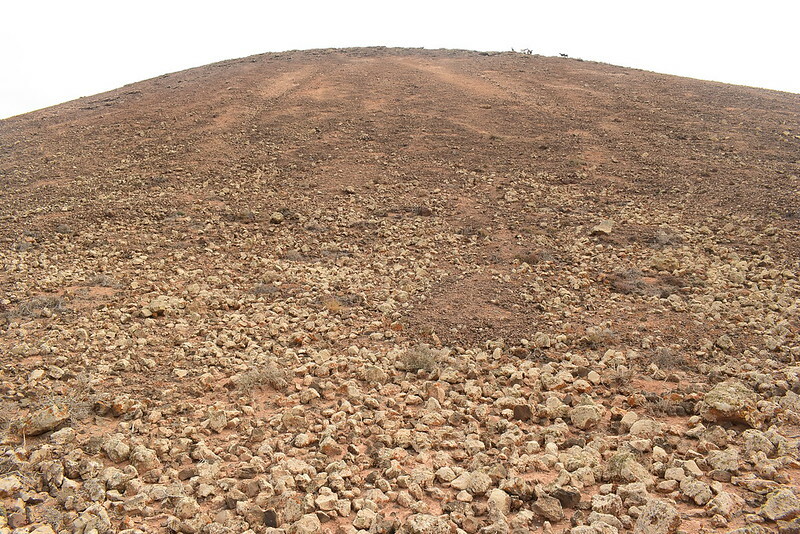 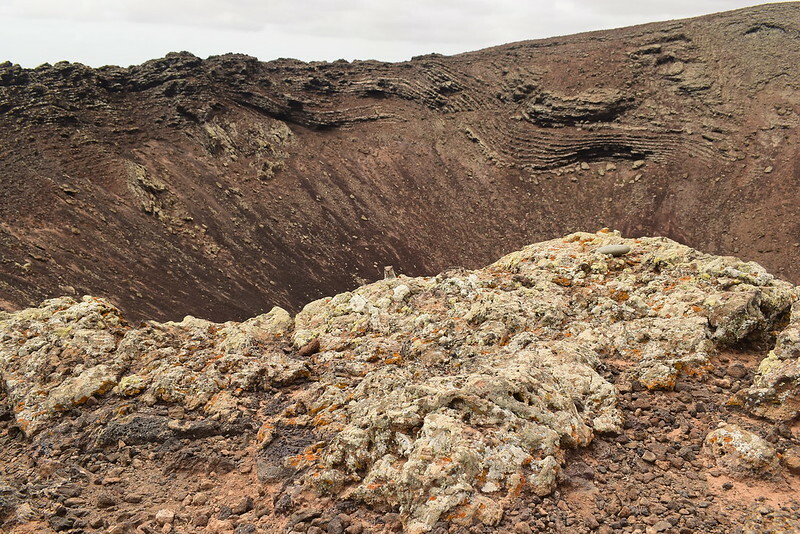 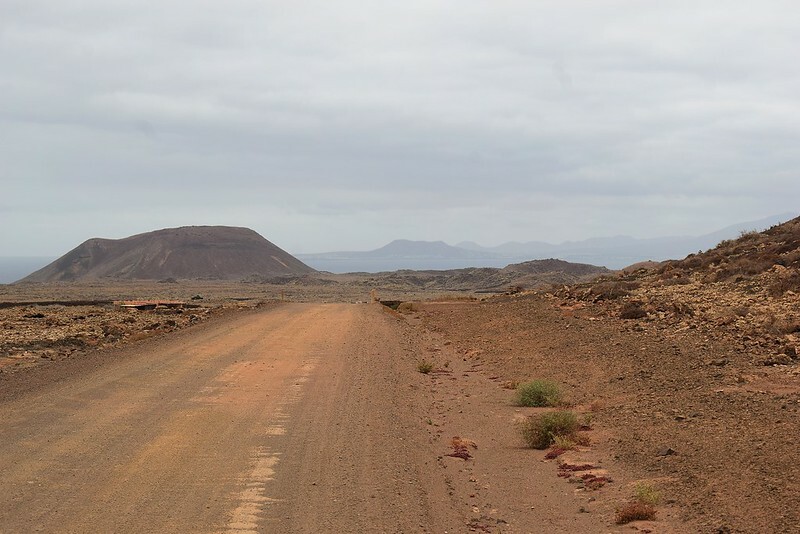 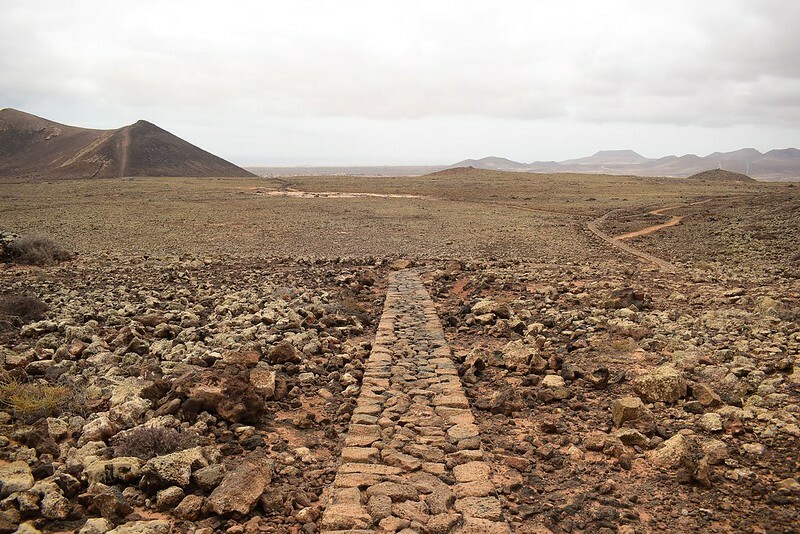 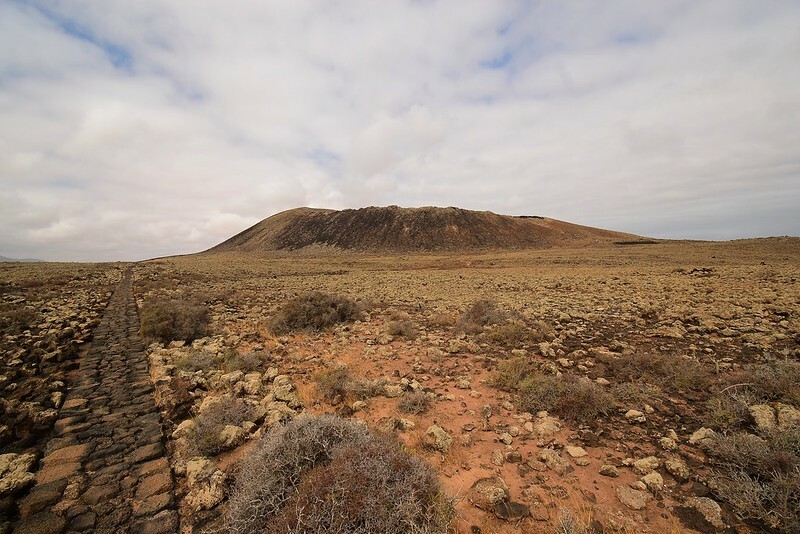 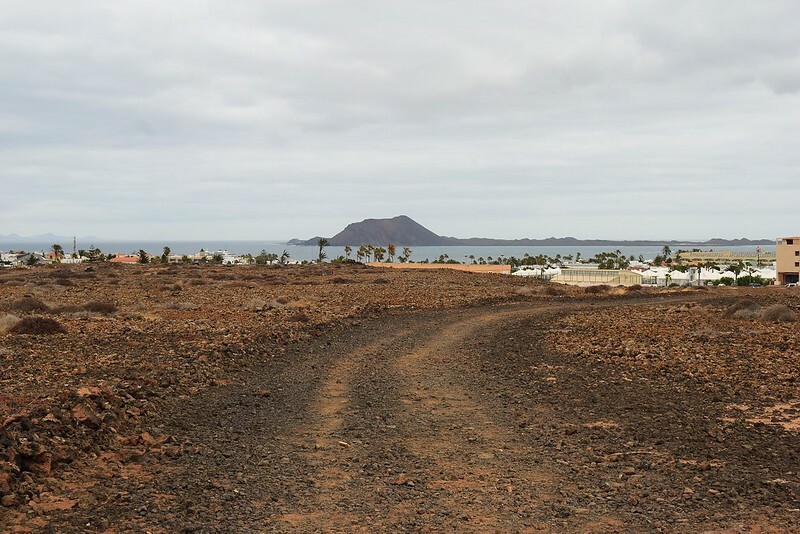 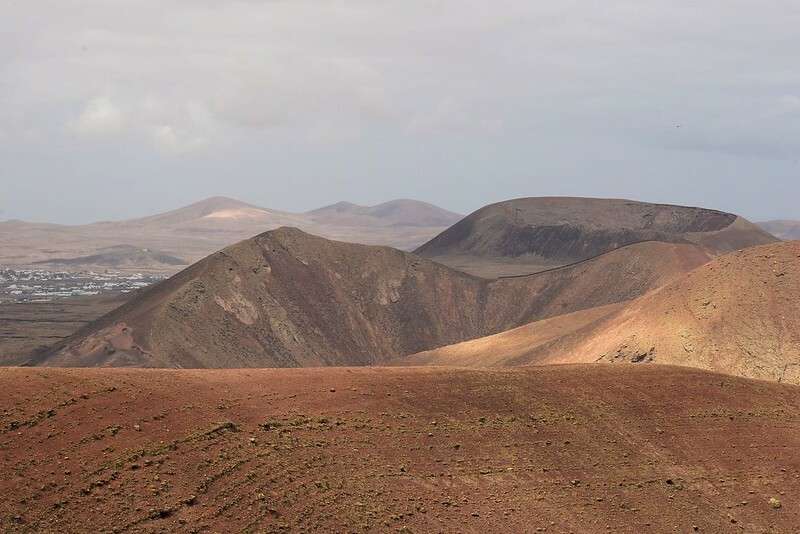 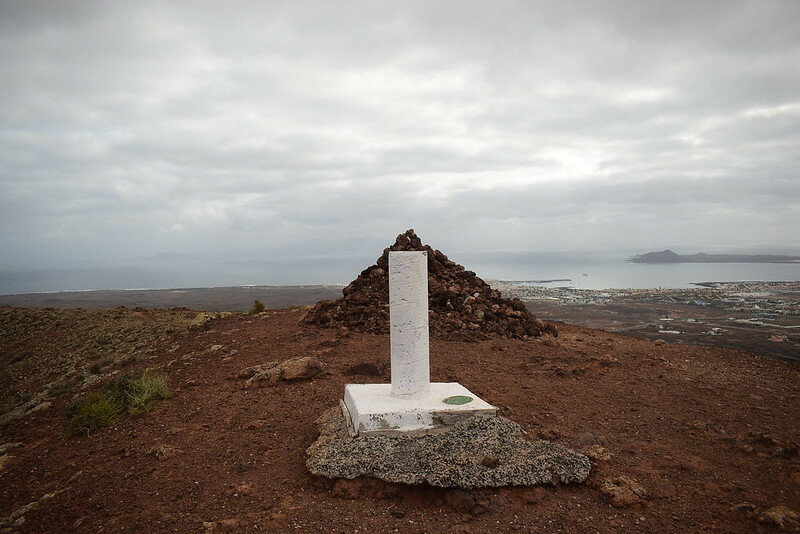 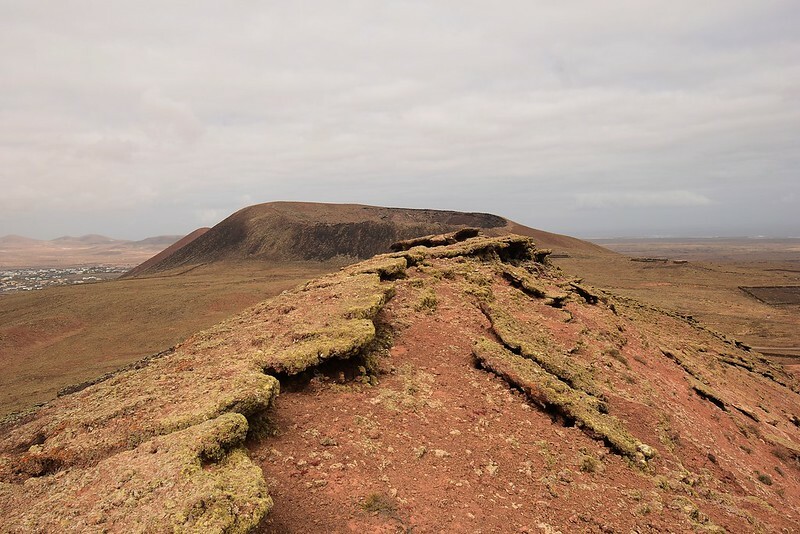 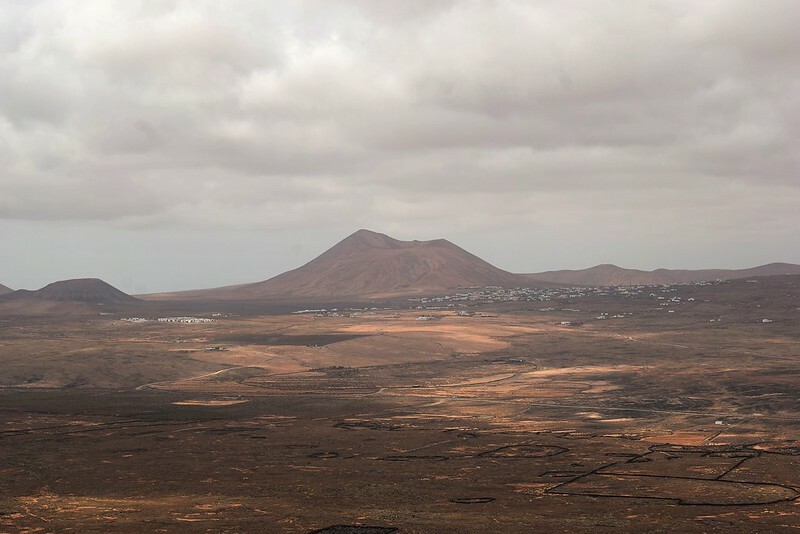 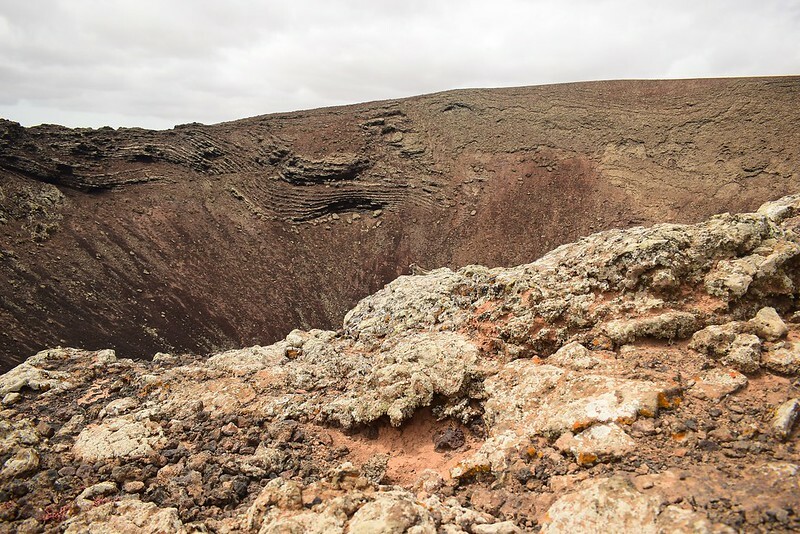 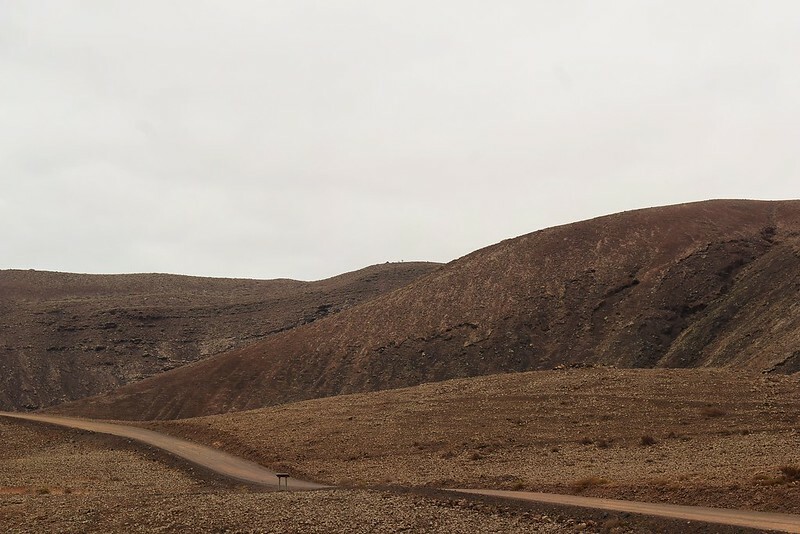 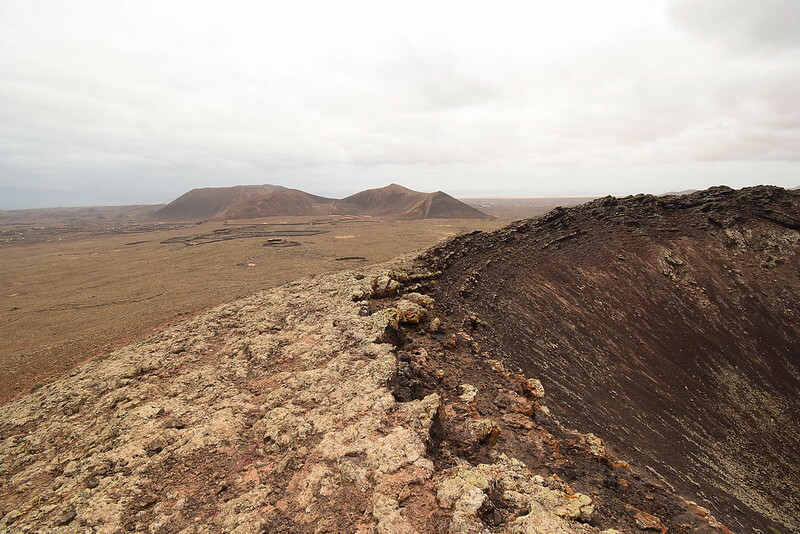 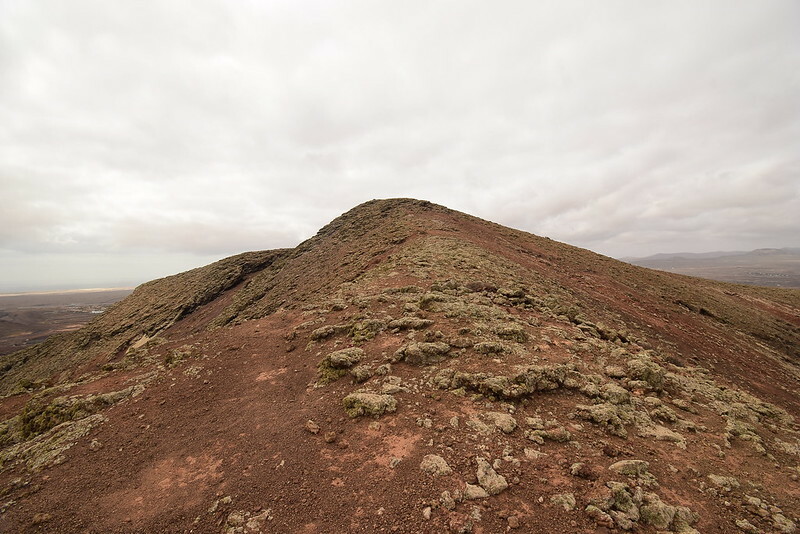 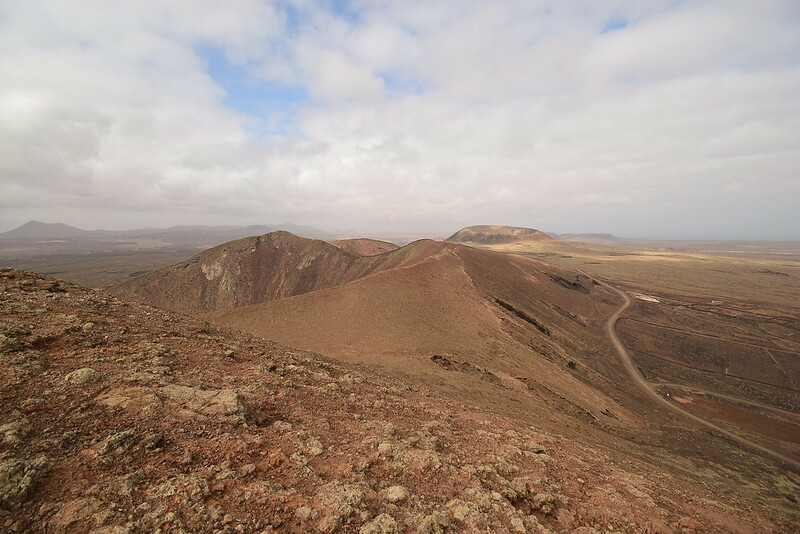 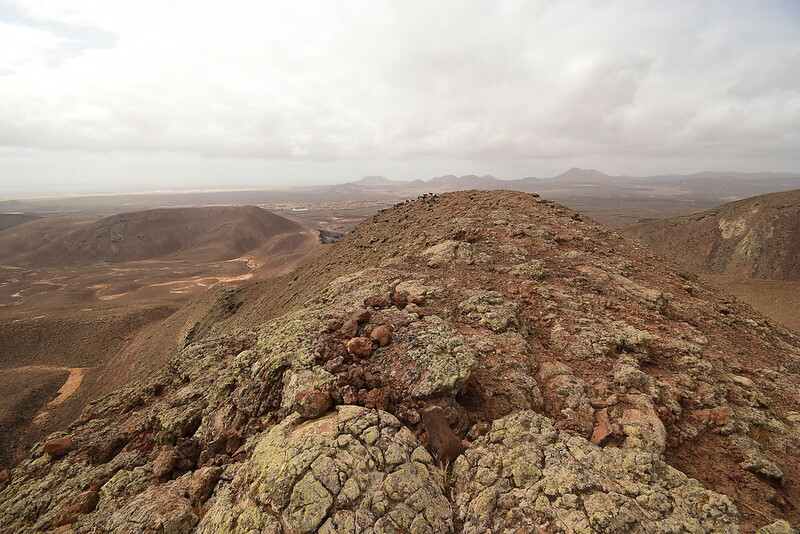 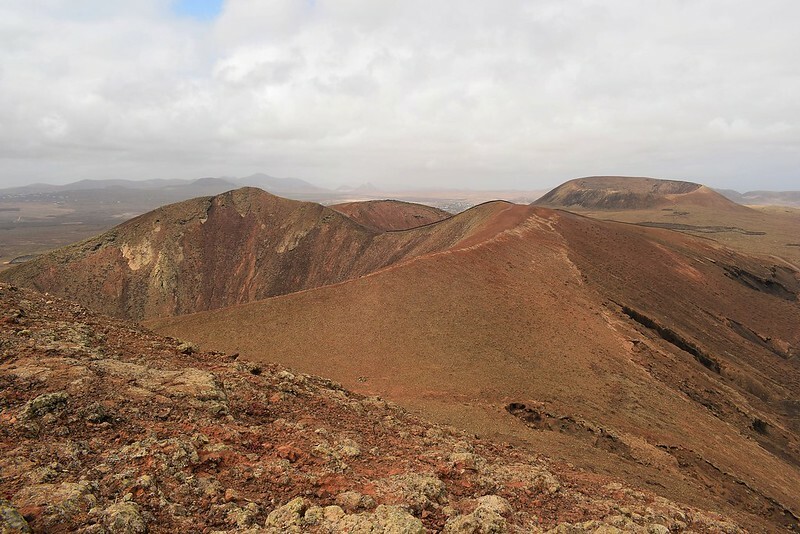 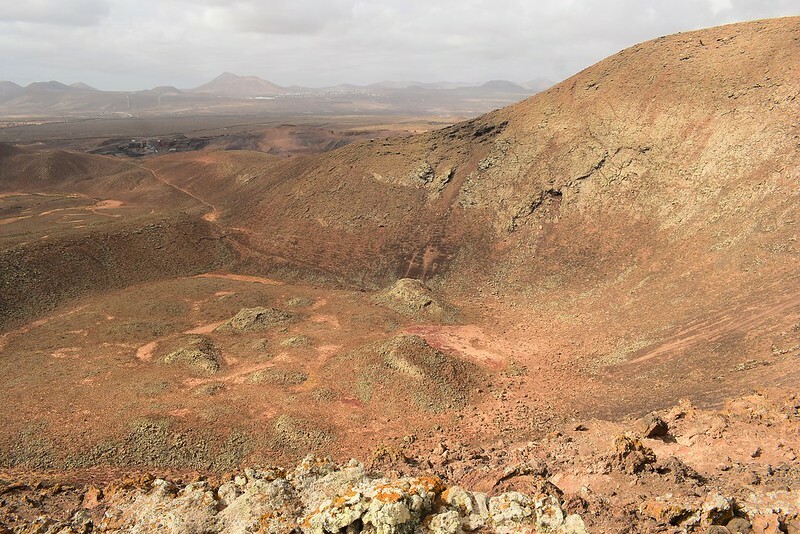 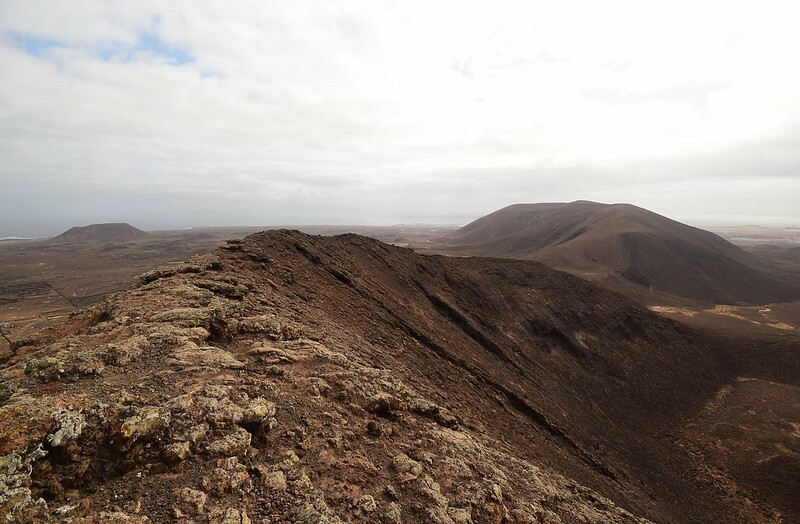 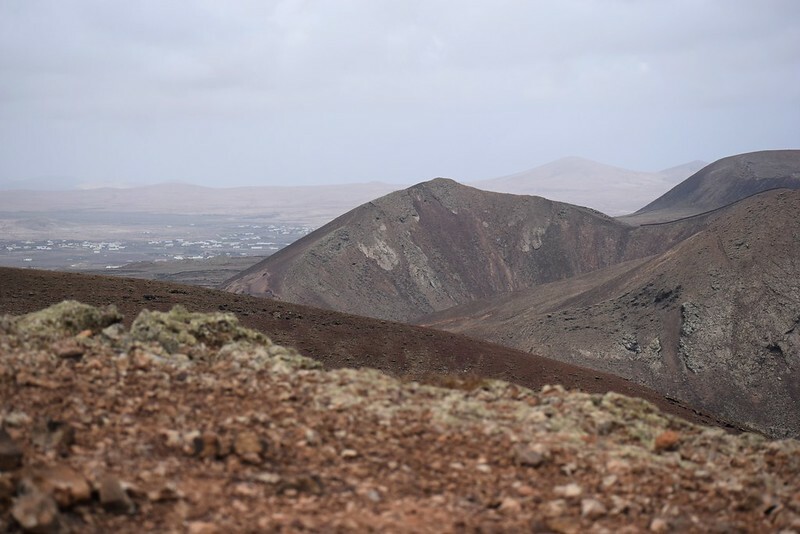 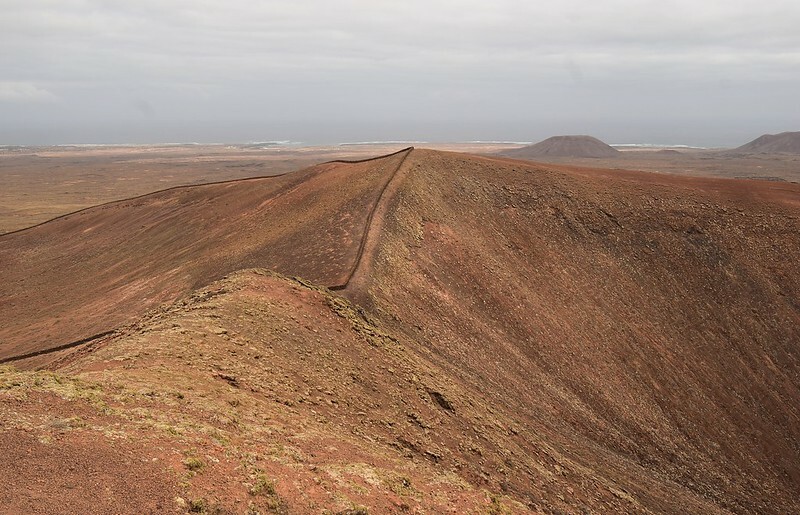 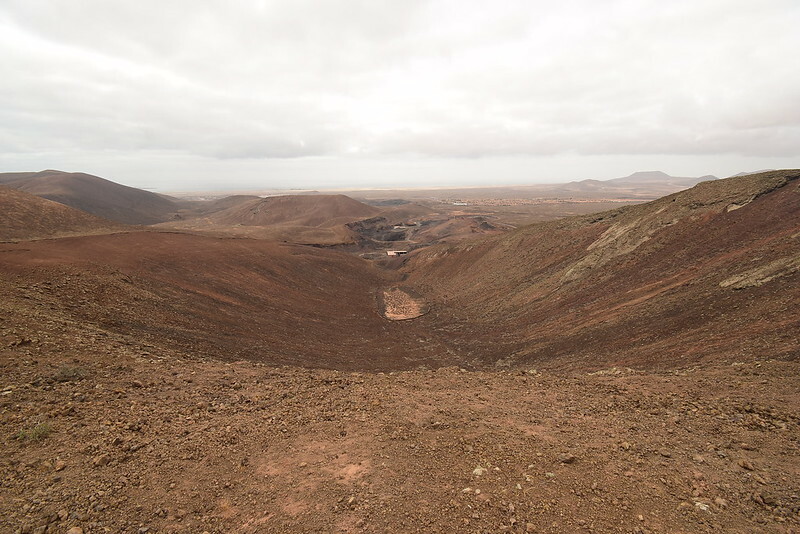 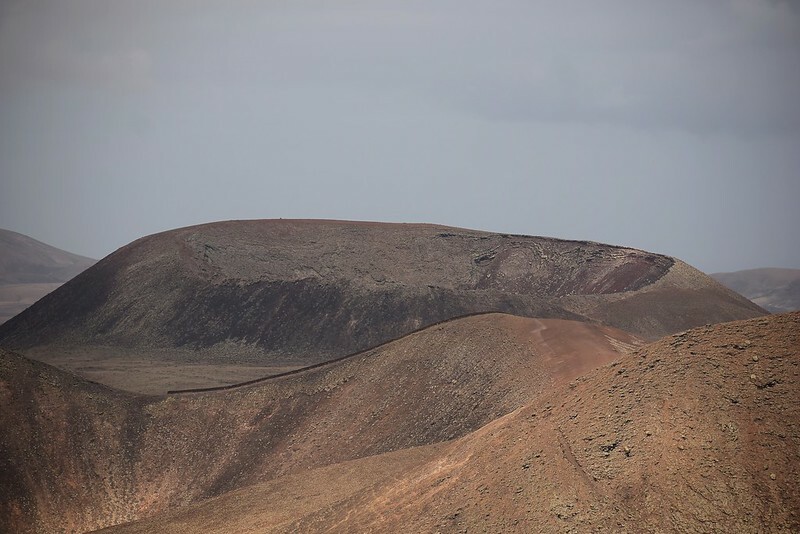 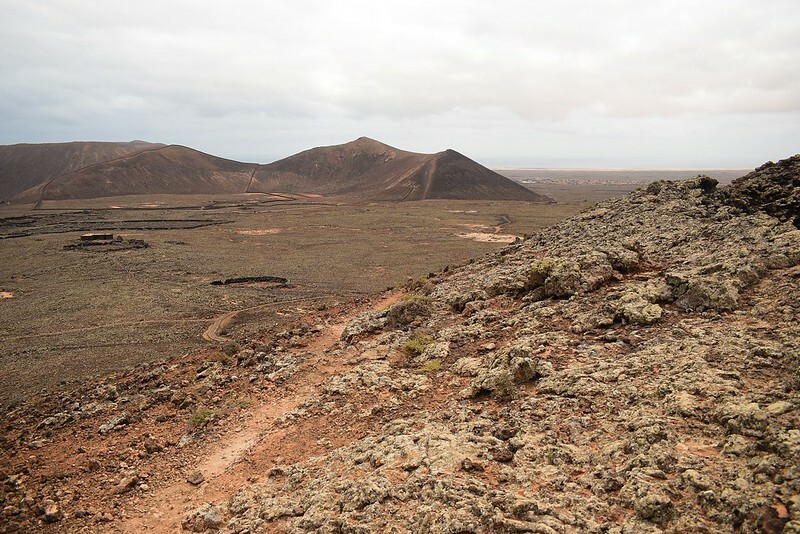 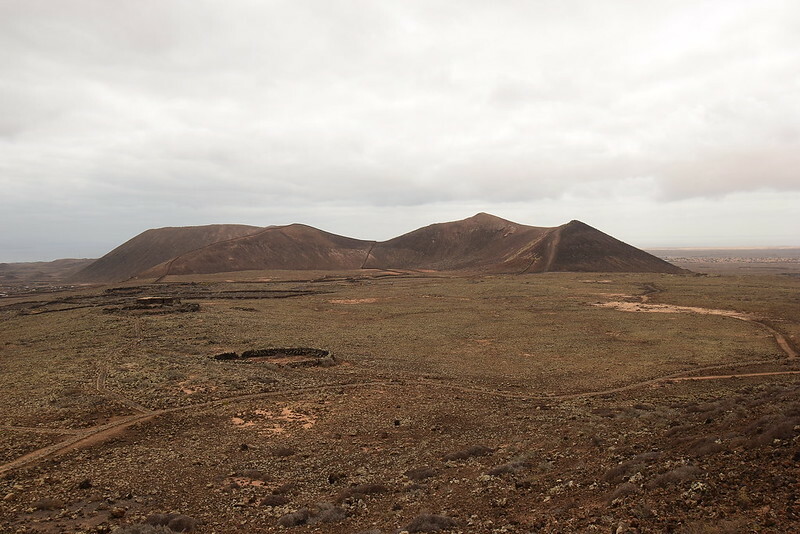 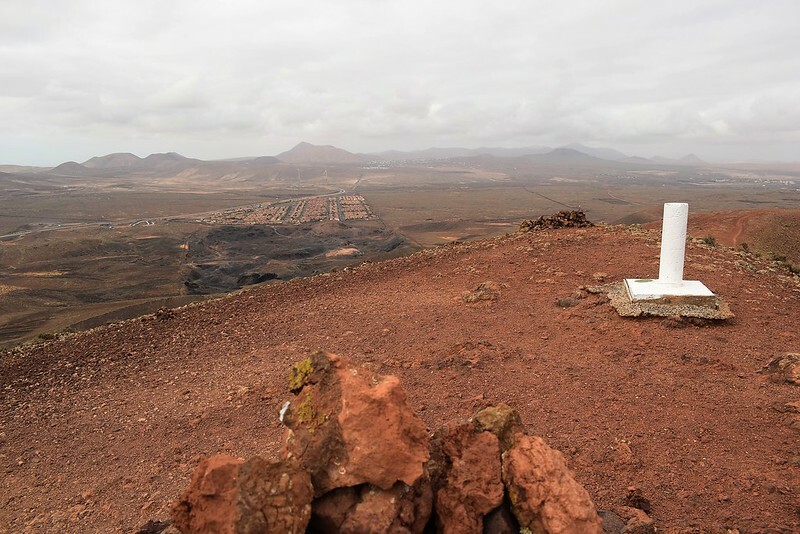 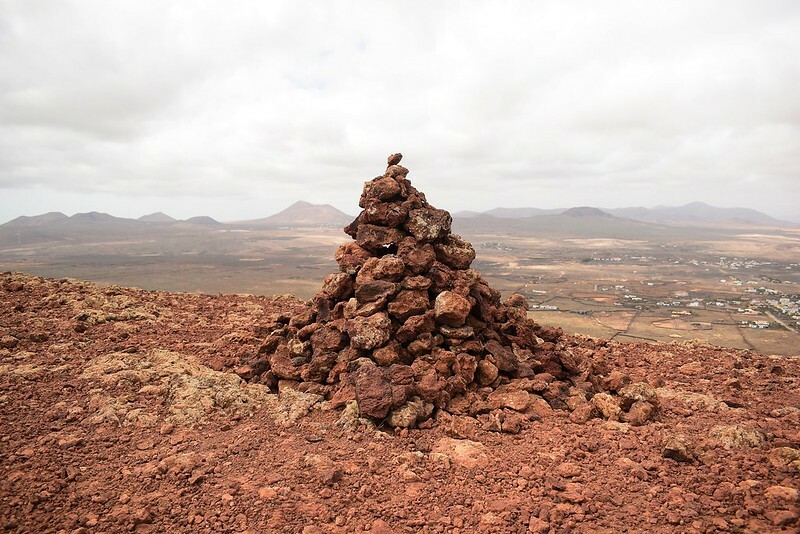 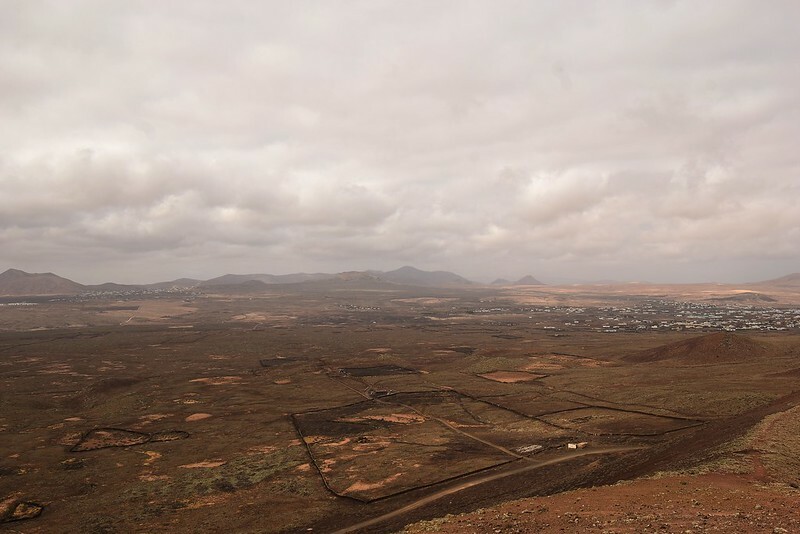 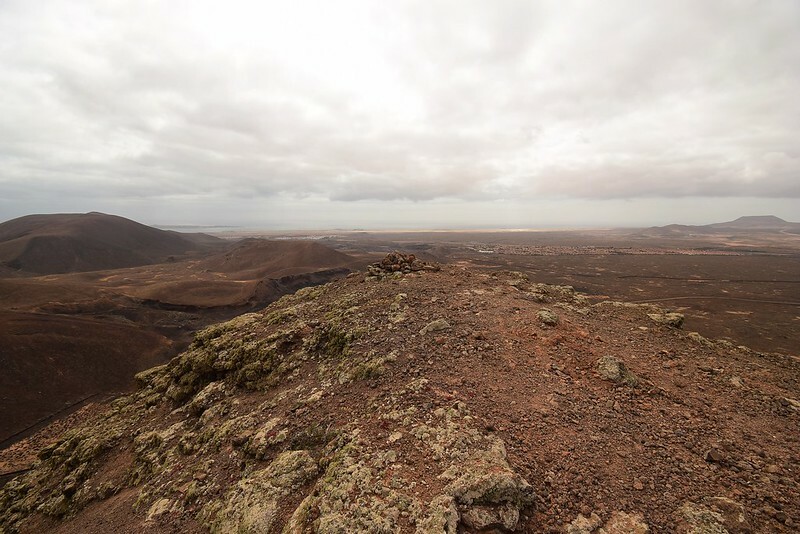 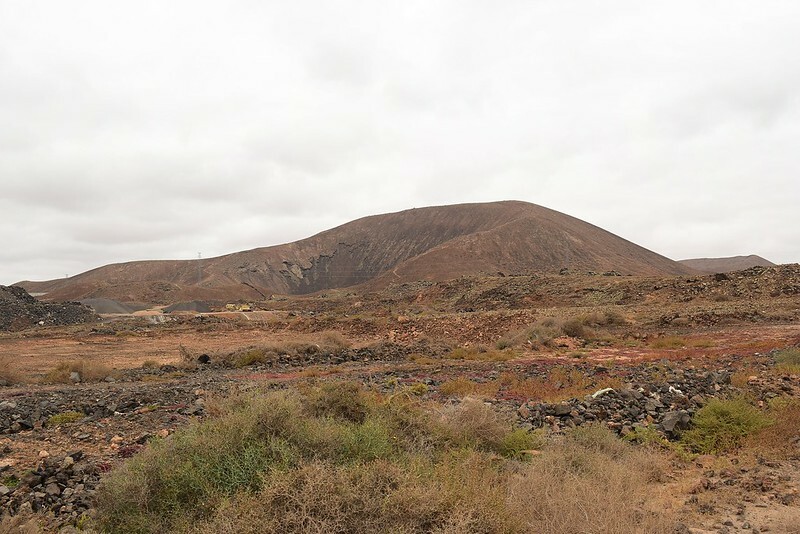 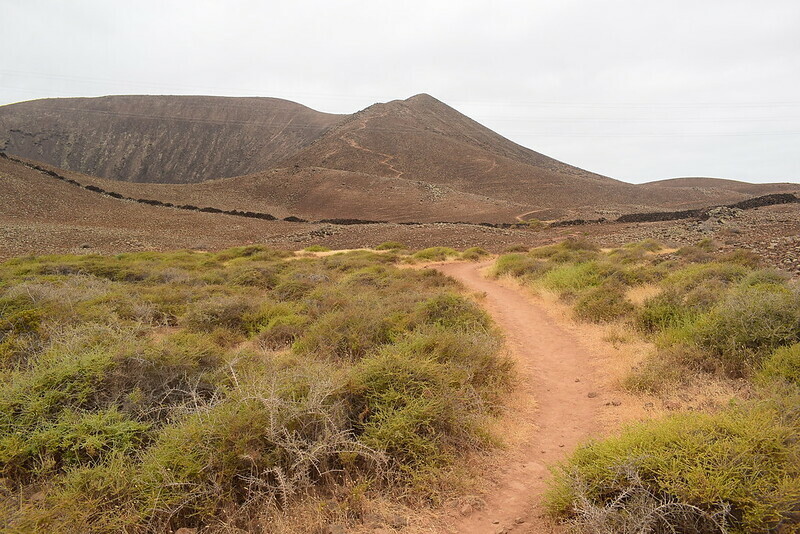 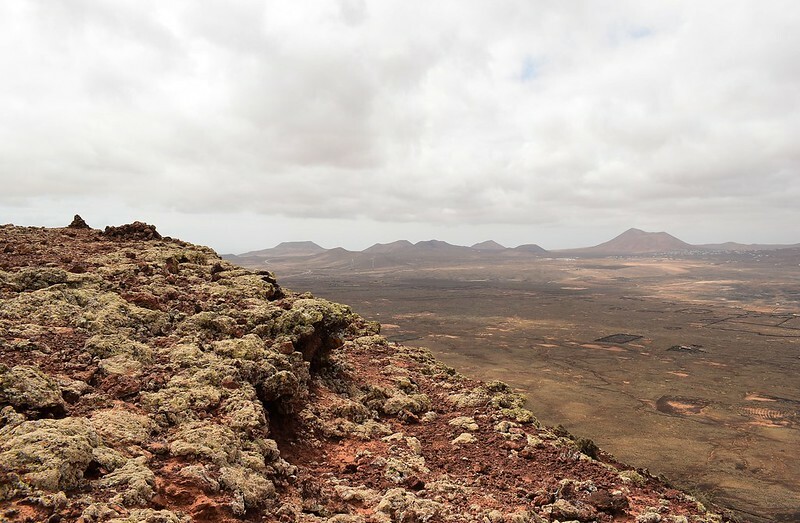 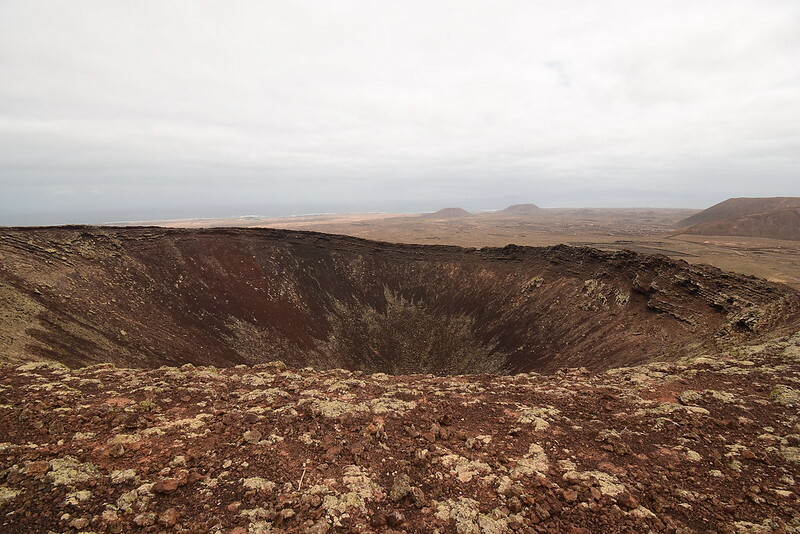 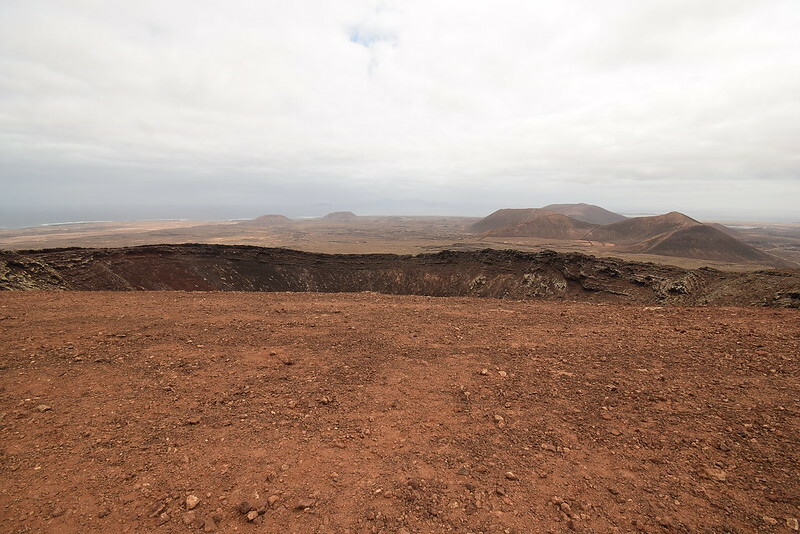 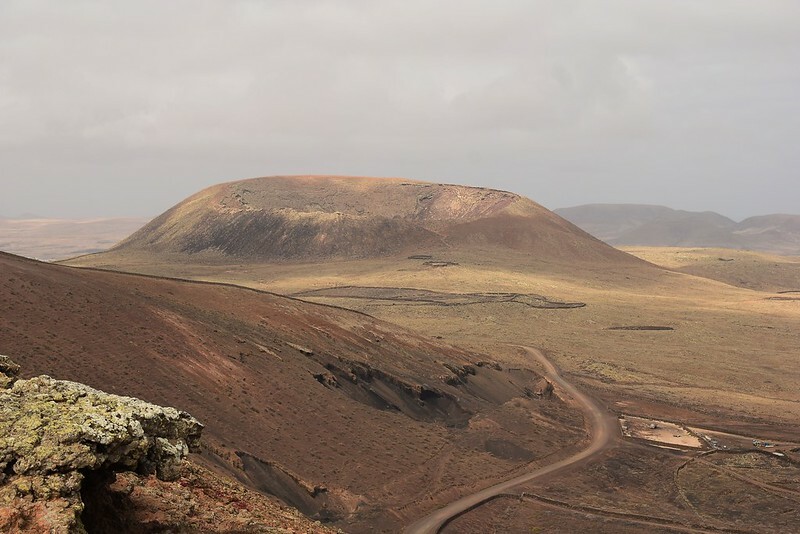 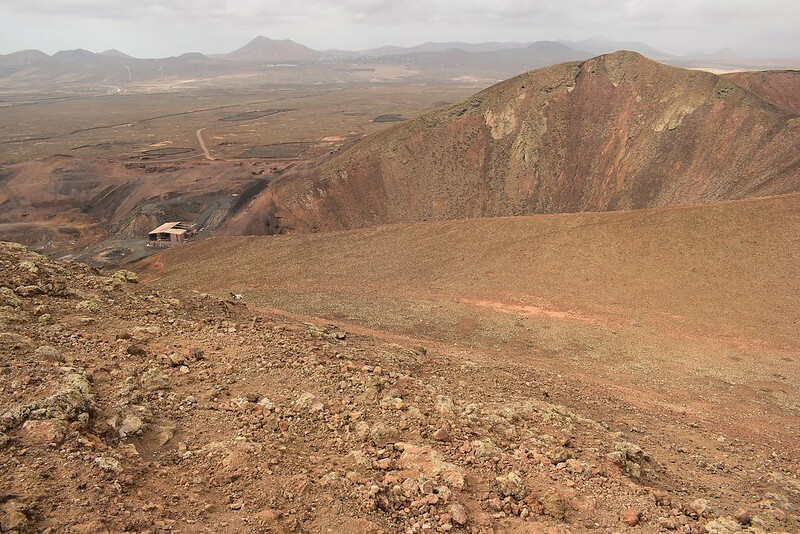 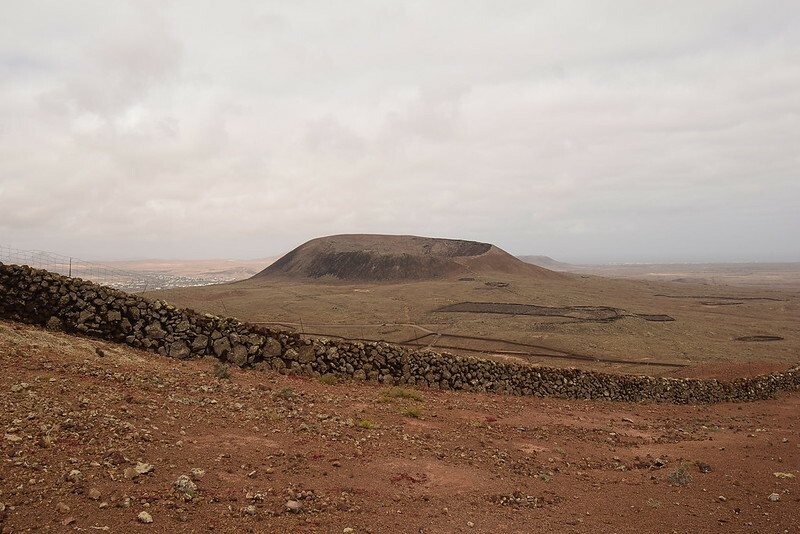 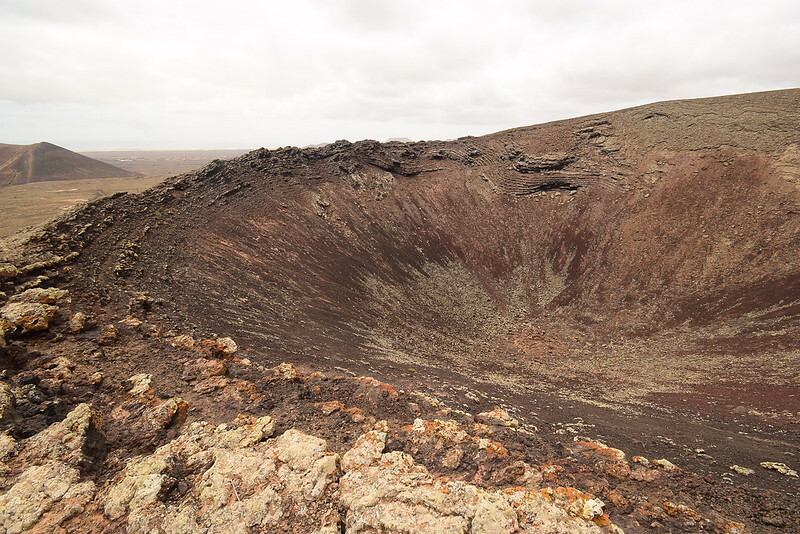 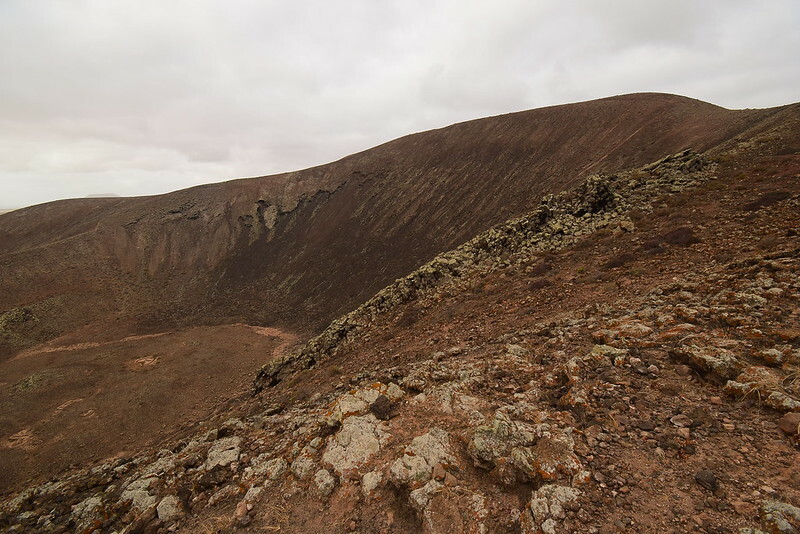 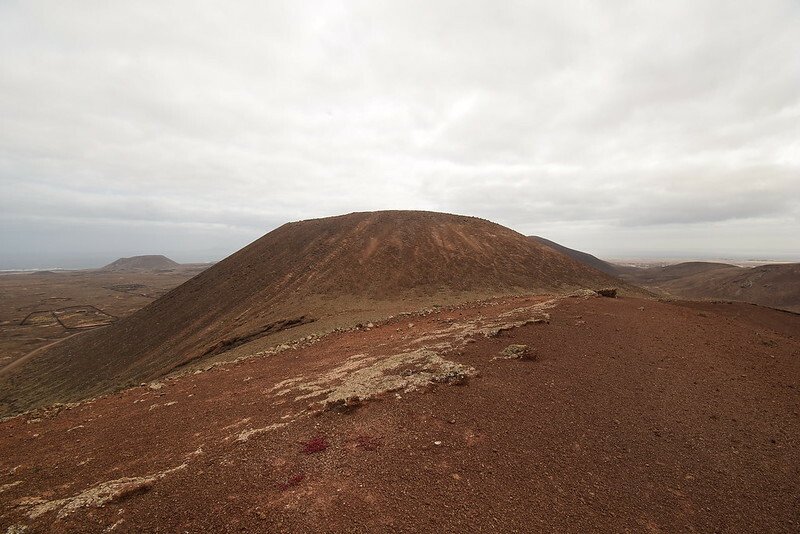 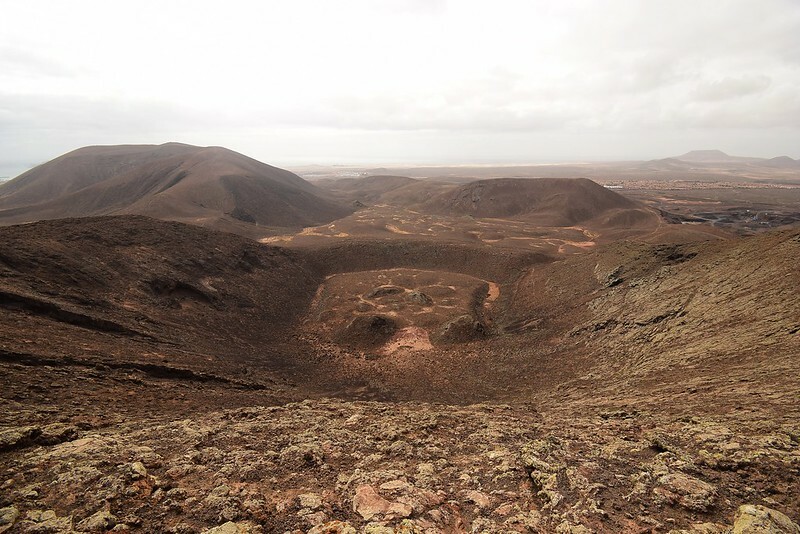 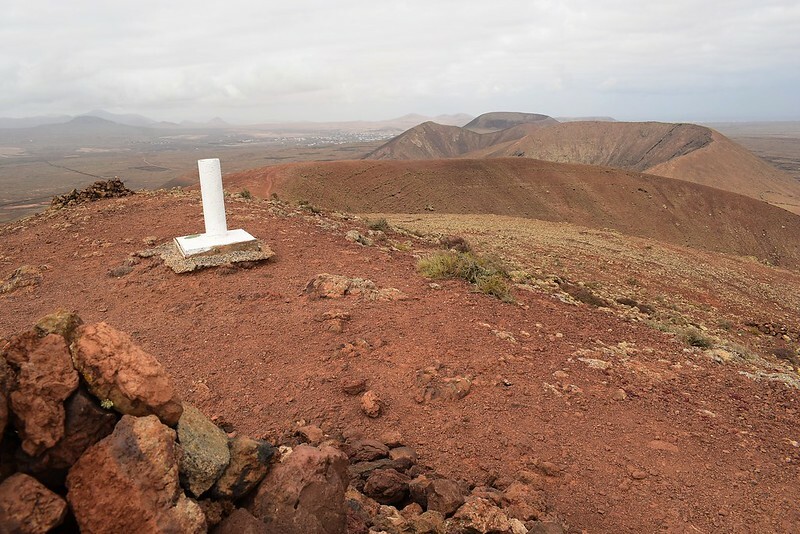 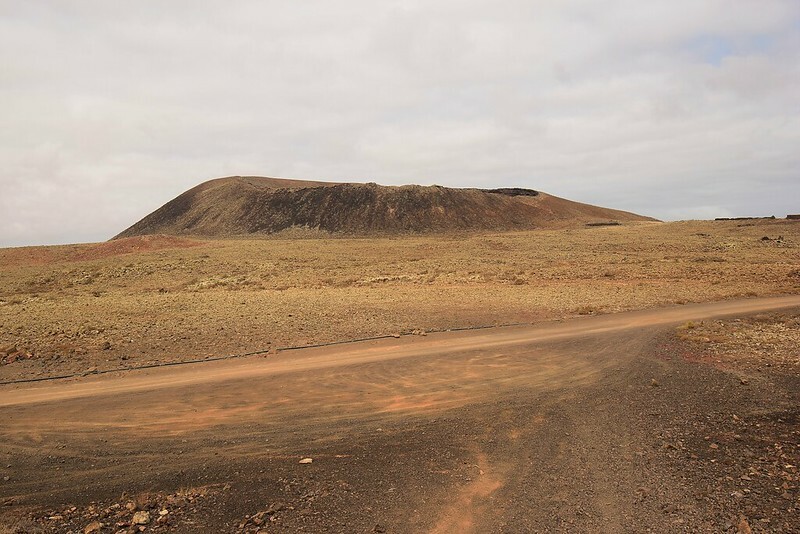 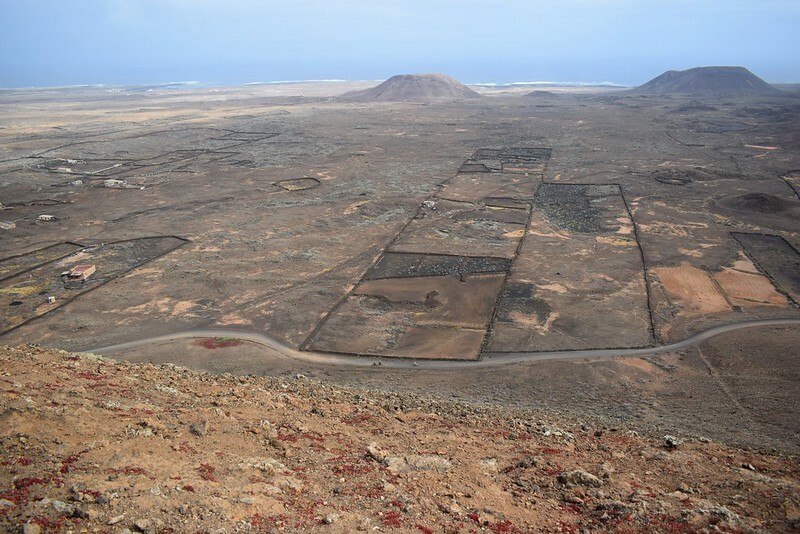 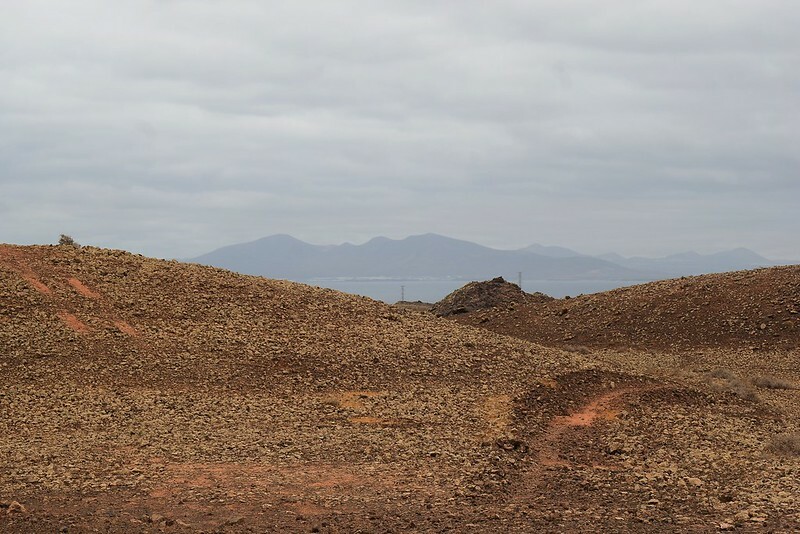 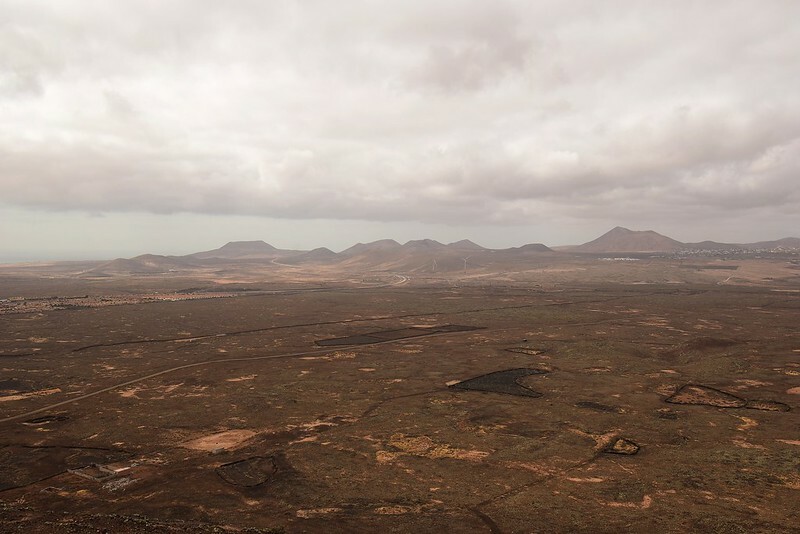 As for walks, well all the bigger volcanic hills are further south but it still left me with the local craters to do and I plotted a route starting and finishing in Corralejo which woould see me traverse a set of craters up to Calderon Hondo, loop around it then head back into town. 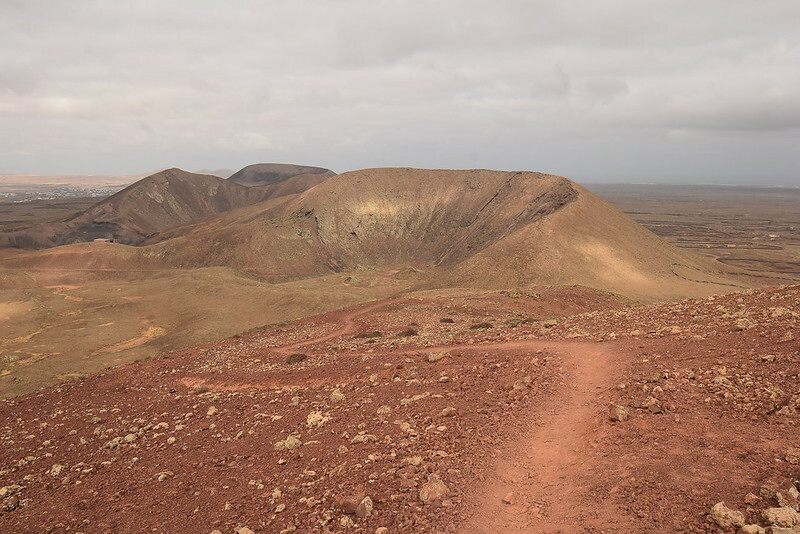 I set off just after 8am, it was forecast to be cloudy and cooler today so perfect conditions for walking on Mars but I still took an extra bottle of water just to be safe. 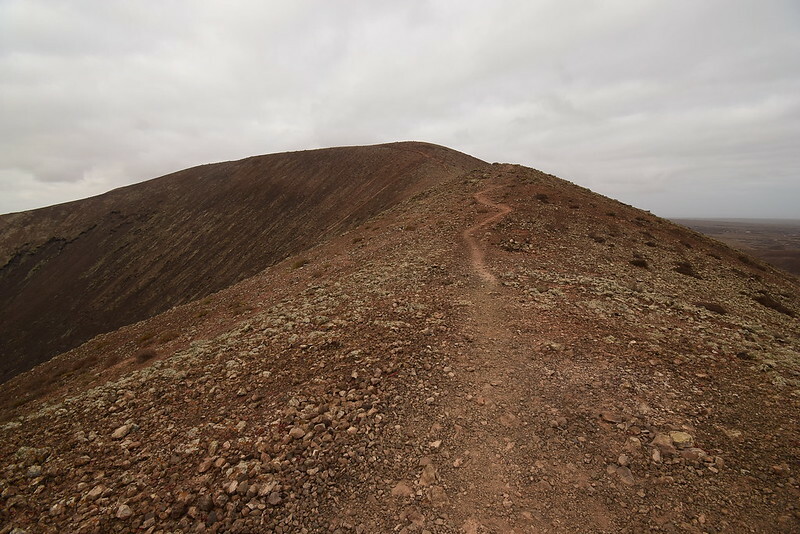 Footwear was my trail shoes which I knew would be fine for the terrain. 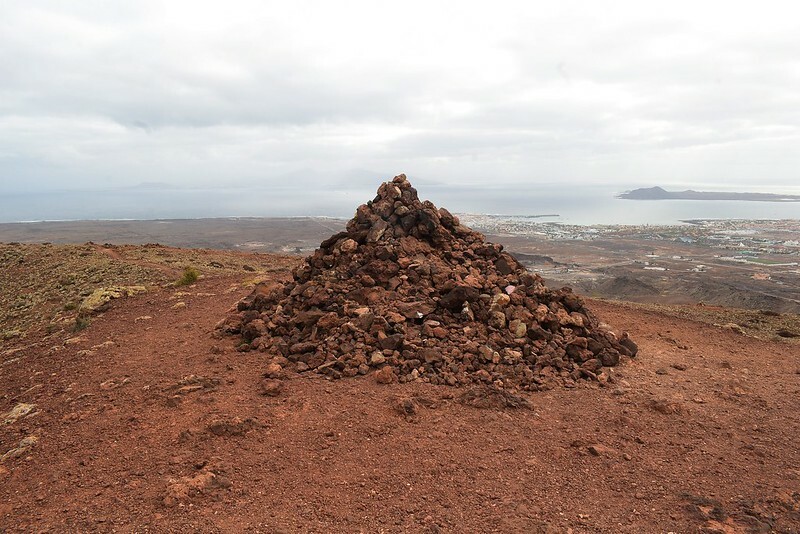 I pass some small cairns and check out the route ahead to the circular Calderon Hondo, this should be fun! 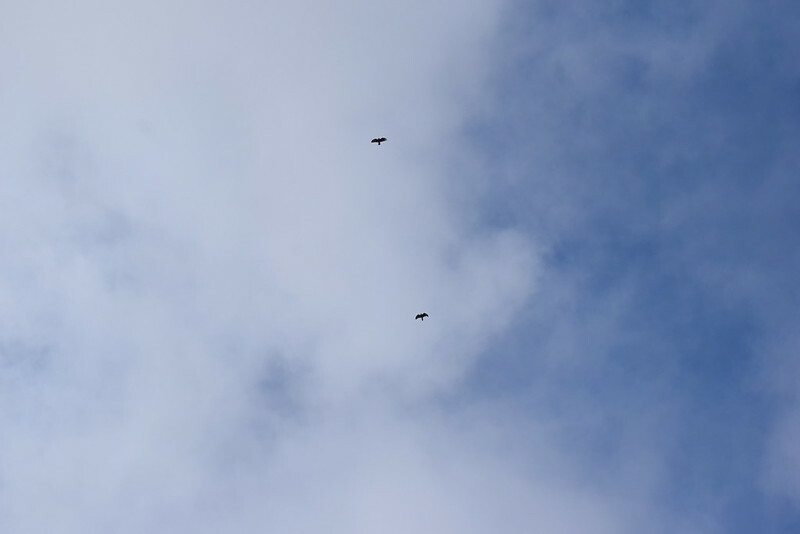 Another screech is heard and I spot a third Buzzard, they are loving being out this morning, what a treat! 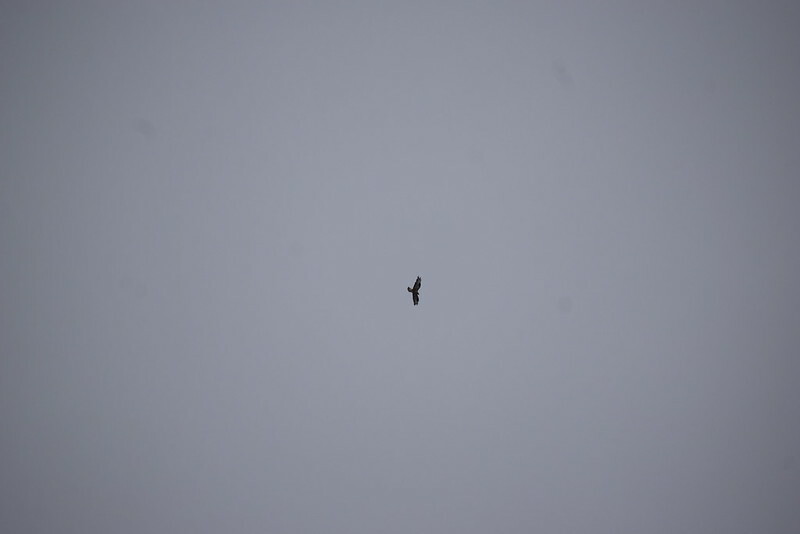 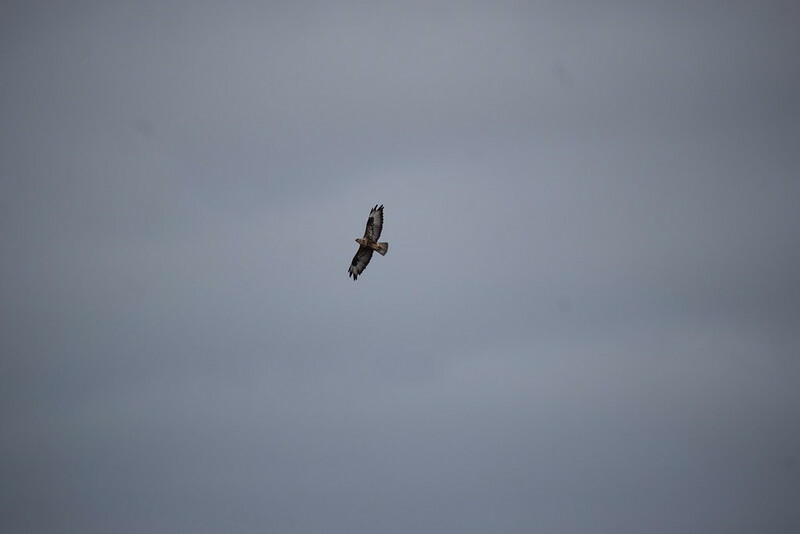 The buzzards are still providing aerial entertainment! 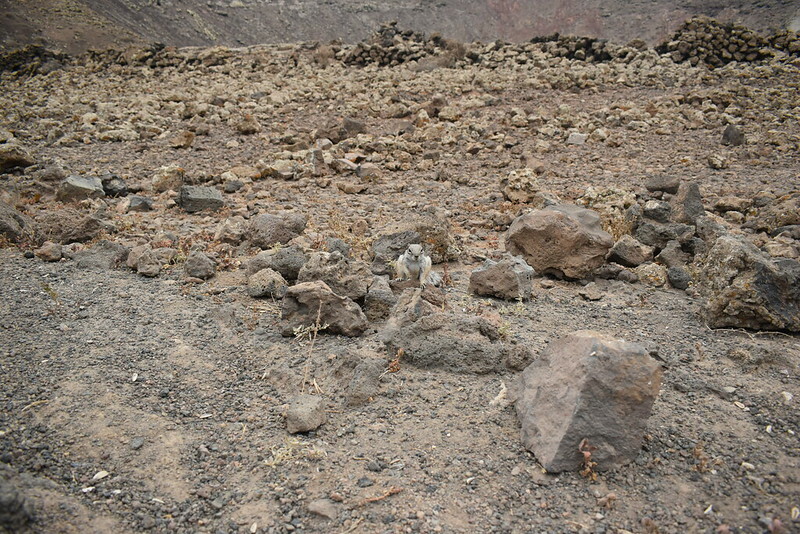 Right, now I have this lot to negotiate...! 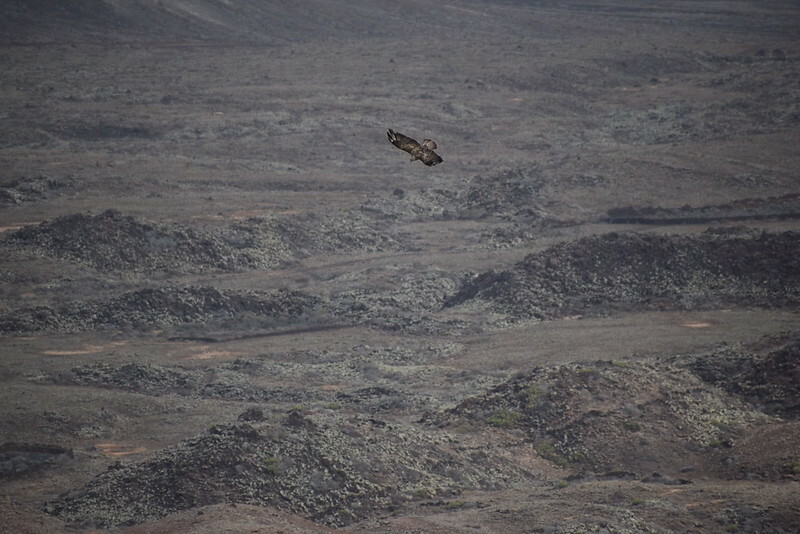 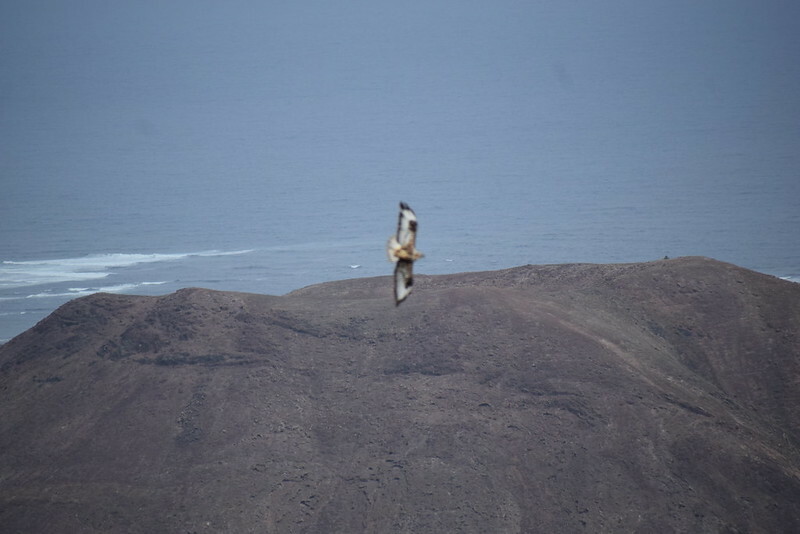 I reach the bottom of the path off Bayuyo and get treated to another extreme close up from one of the Buzzards who turns mid-air about 20 feet away from me before flying off again, wow! 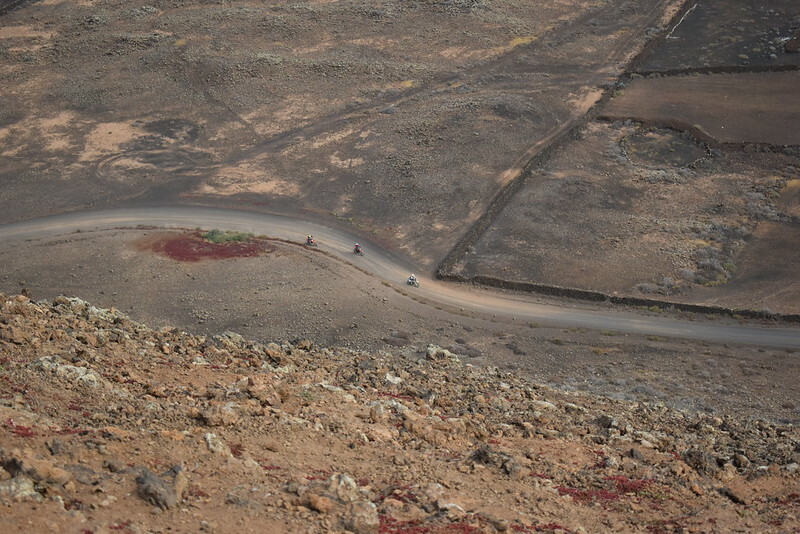 Followed by trail bikes down below, it's all happening on Mars 2.0 today! 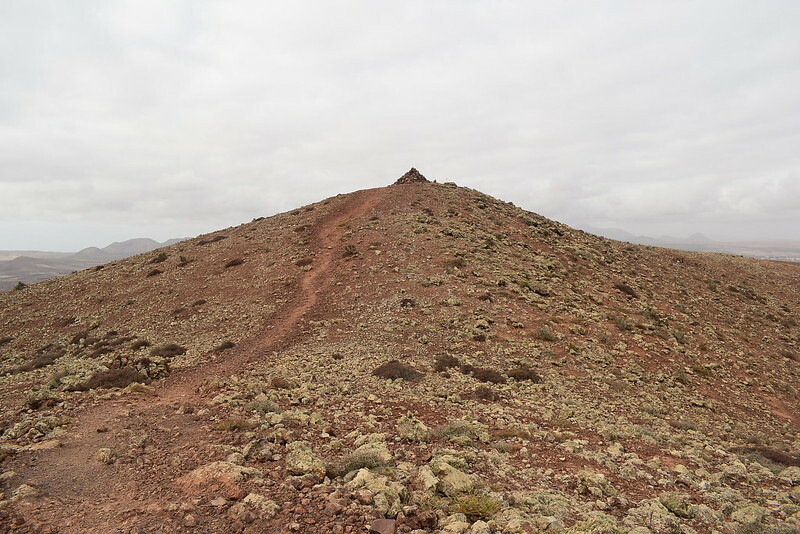 Continuing along there is no clear summit but i'm walking along the ridge top anyway so will have been on it at some point. 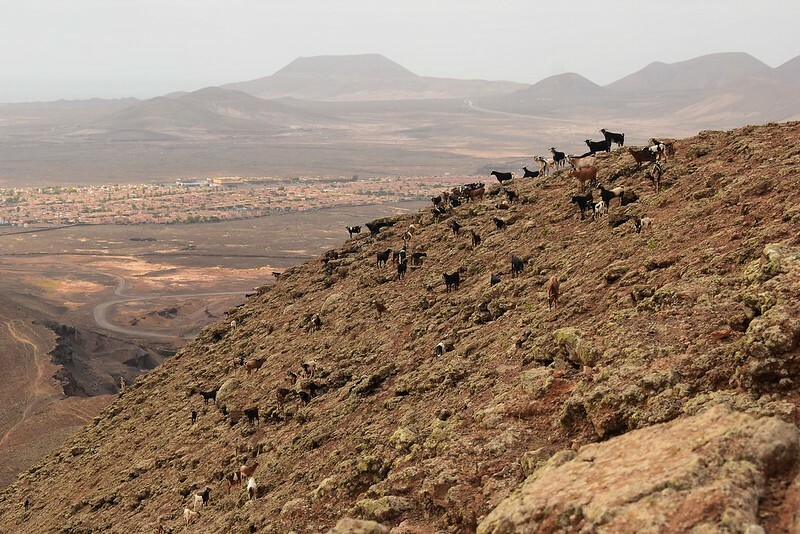 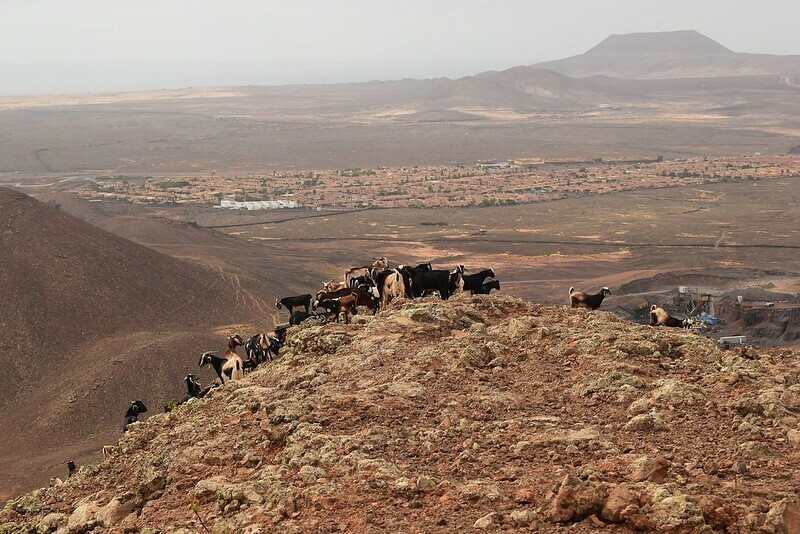 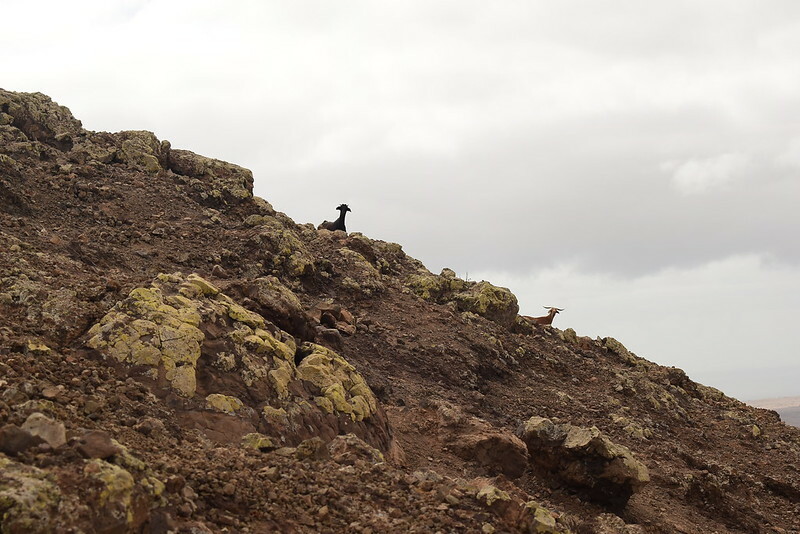 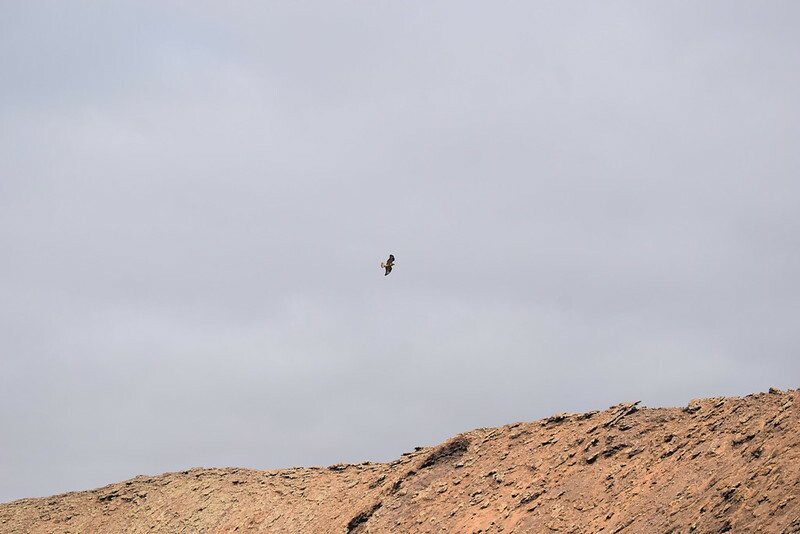 Then a noise... a strange noise... aha the evil goats of Fuerteventura are blocking the end of the ridge! 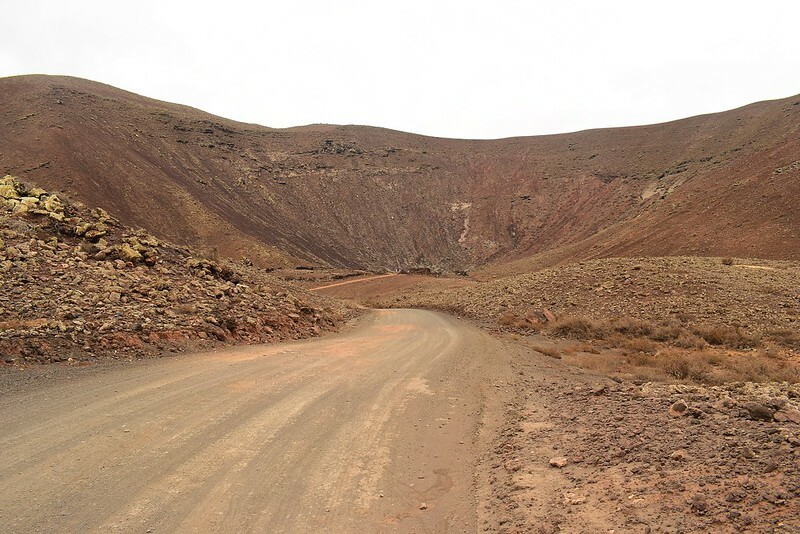 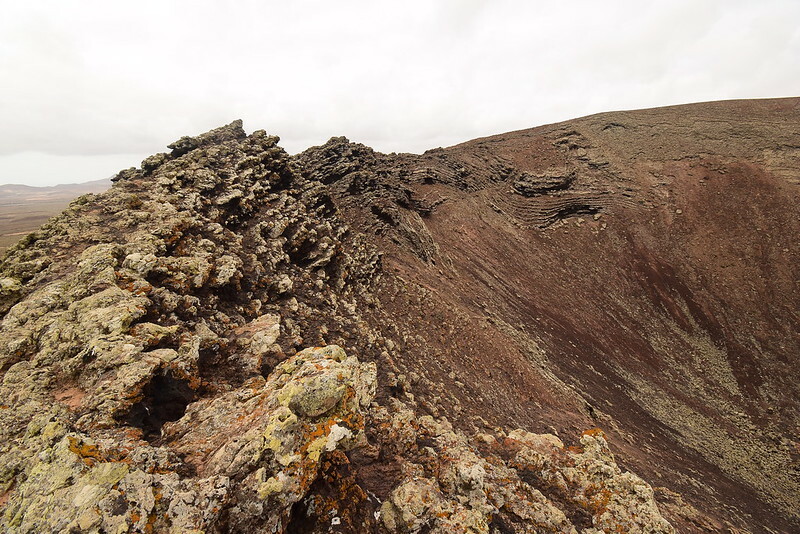 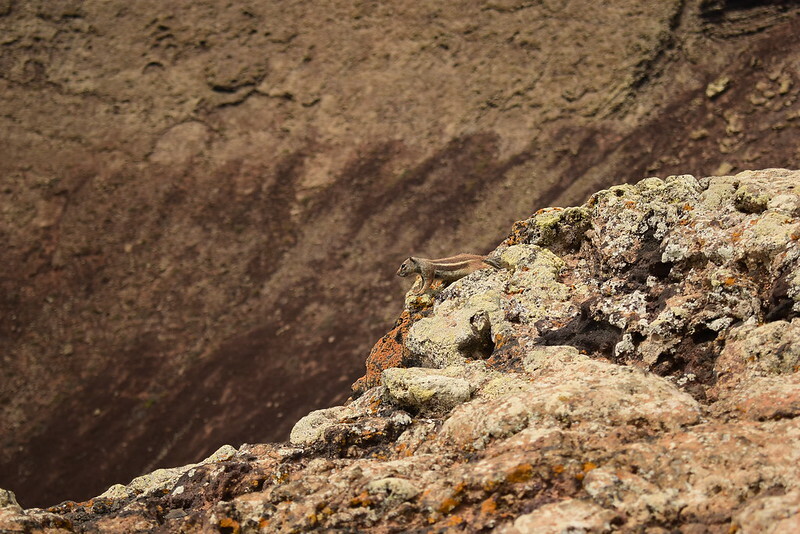 Exit stage right down a steep volcanic scree slope! 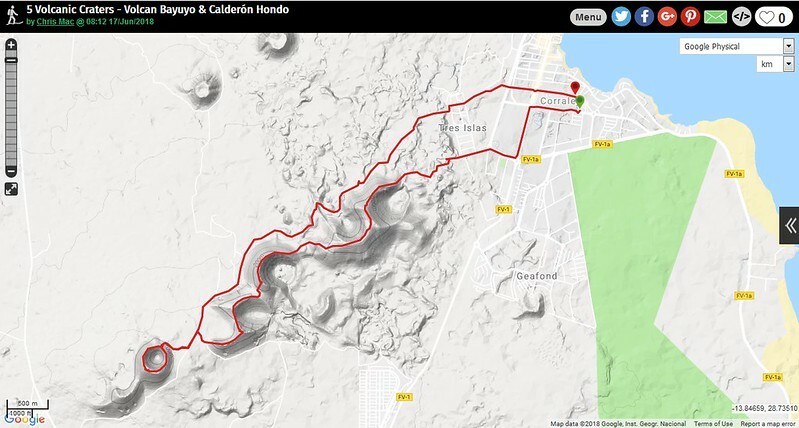 This has been fun so far, a complete contrast to the lush green Ochils and Strathyre hills I was climbing the previous weekend! 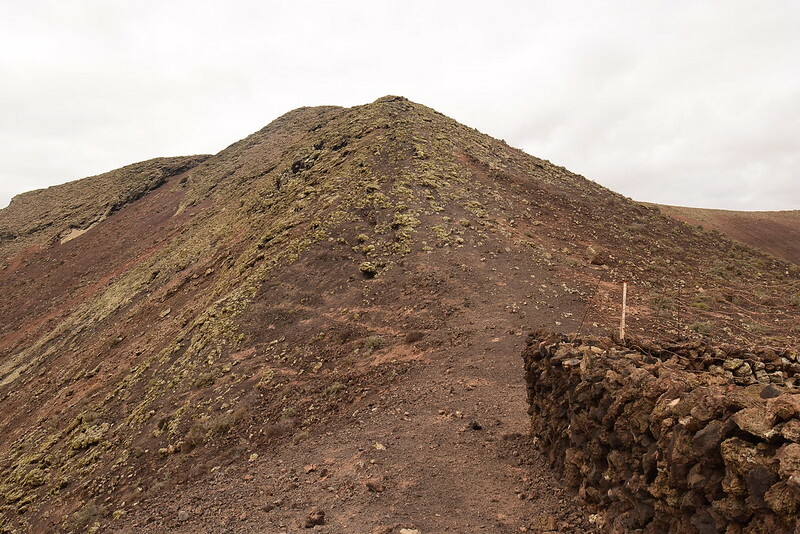 Not the biggest or most scenic but they'll do fine for a volcanic holiday stroll! 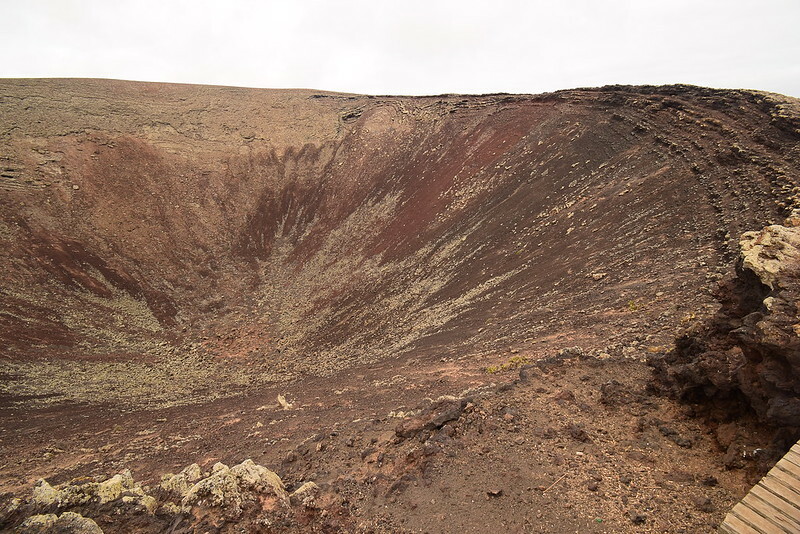 It's an impressive big crater, not quite as impressive as the meteor crater in Arizona but still good enough! 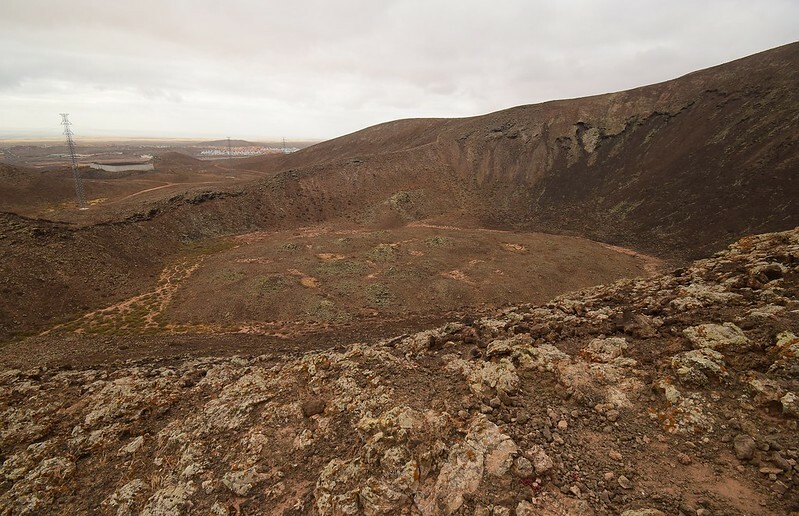 I toy with the idea of adding it in then decide against it, the view is better from here and Iw ant to loop around the crater so i'll have a break here then head back afterwards. 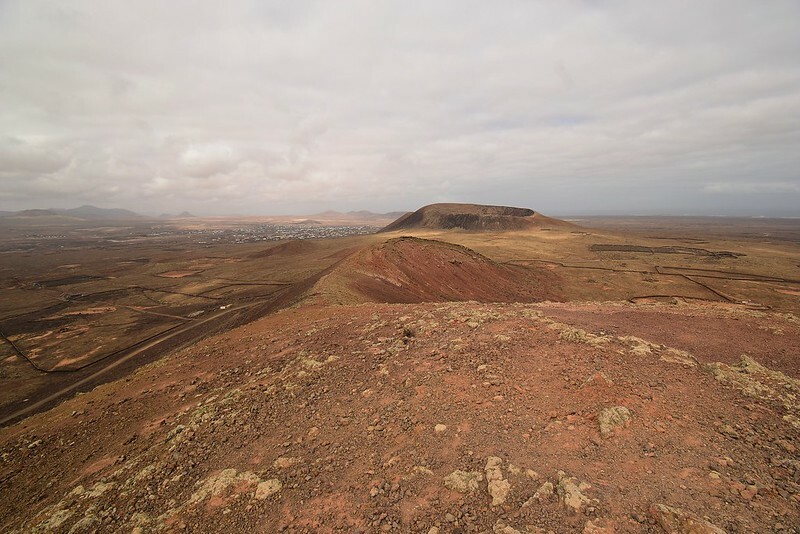 Lajares and Distant Tindaya, the sacred volcanic mountain! 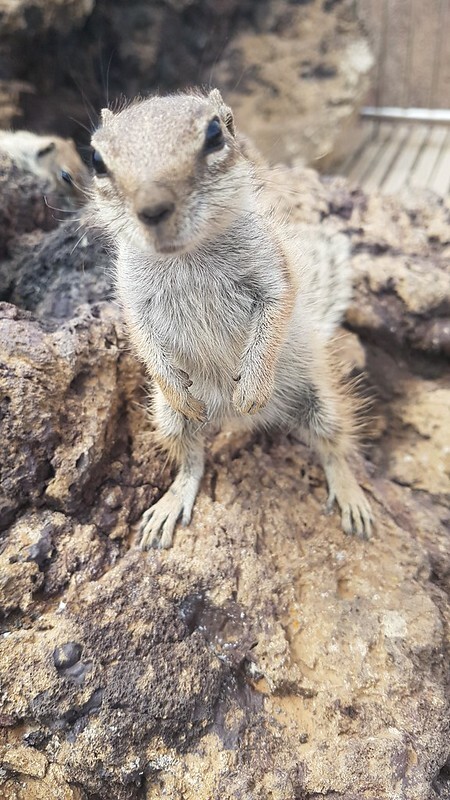 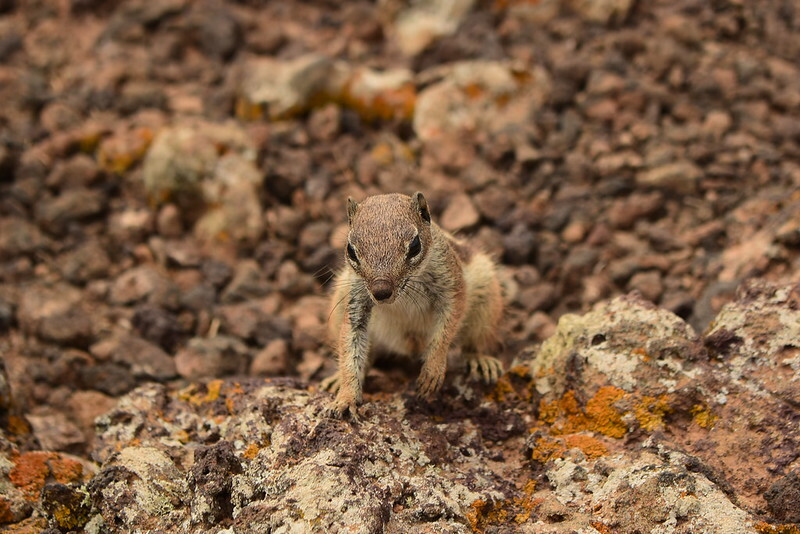 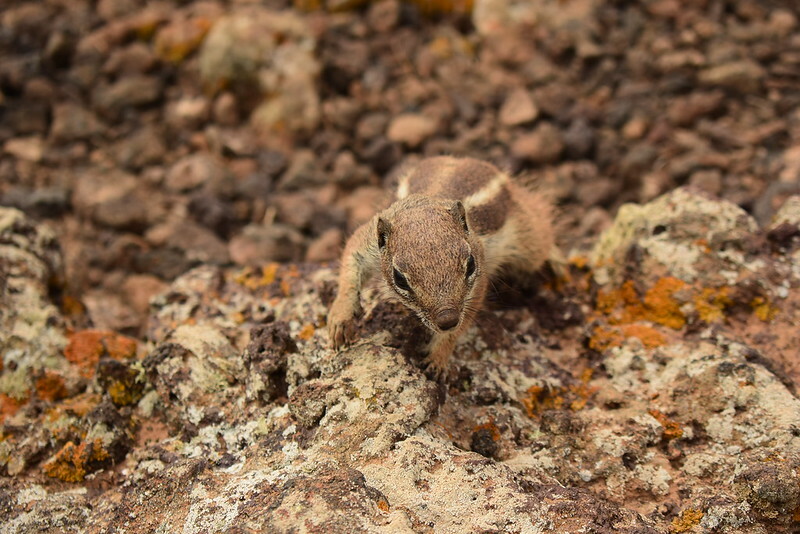 On the way along I spot movement... now a few days before we had gone for a wander towards the dune sea and ended up taking a path up the side of it, only to be accosted by a large troop of Barbary Ground Squirrels, the amazing wee chipmunk-esque squirrels that are lightning fast, friendly and curious. 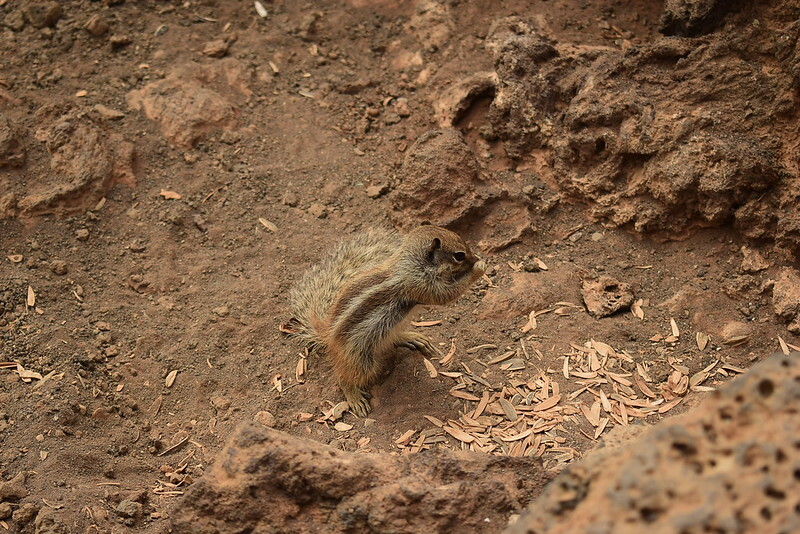 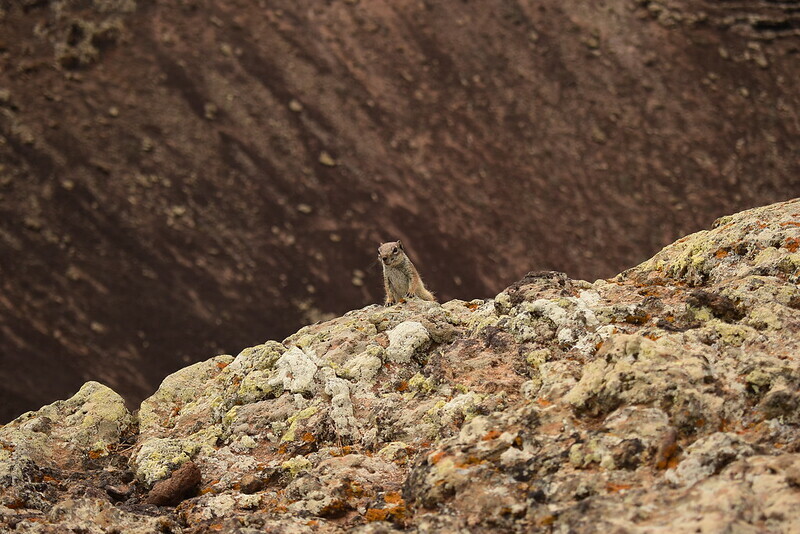 I knew they liked the mountain habitats too and I had just found another troop up here, brilliant, they are hilarious! 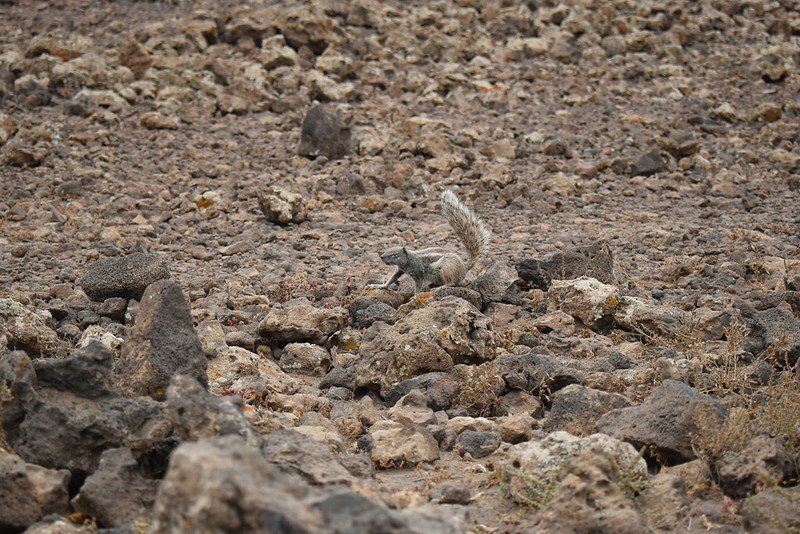 Several off them were racing about looking for food but I didn't have any nuts or similar, only later would I find out that they are often looking for water so if you go here and see them, give them a wee drink! 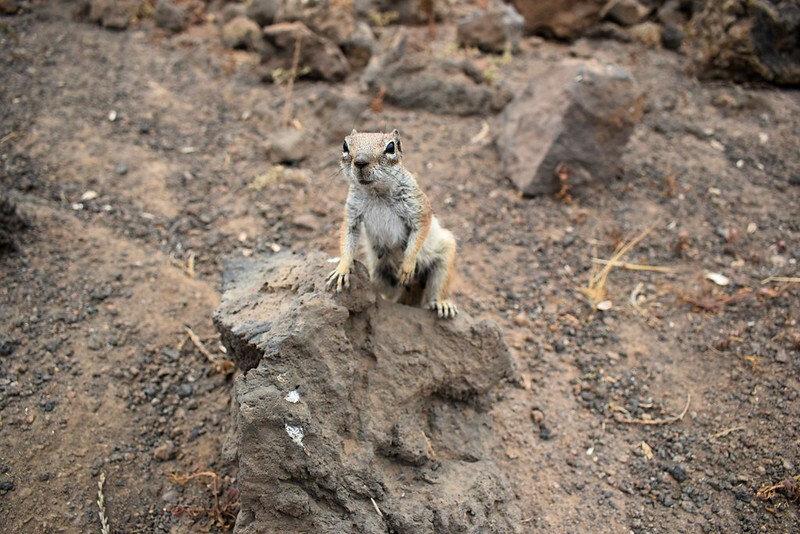 Chuckling away at their antics I head off again back to the platform and get followed, introducing some more tourists to my new pals as they all get acquiainted with each other! 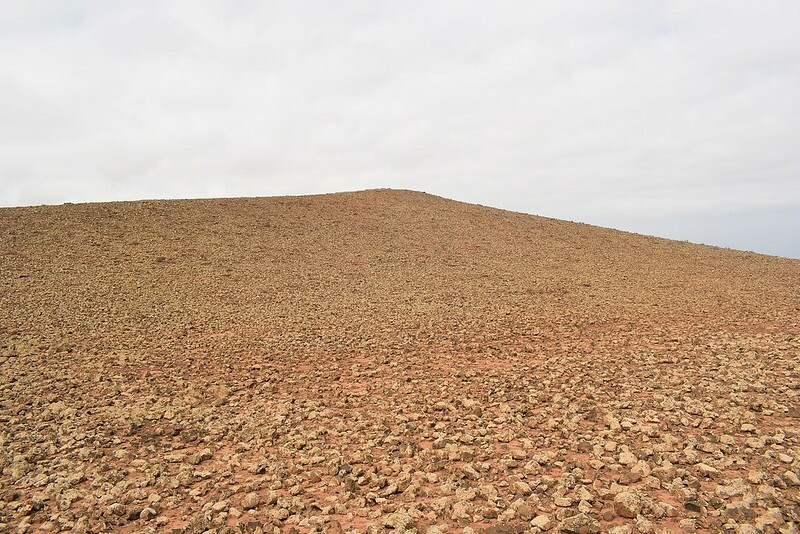 Cheerio wee guys, it's been fun! 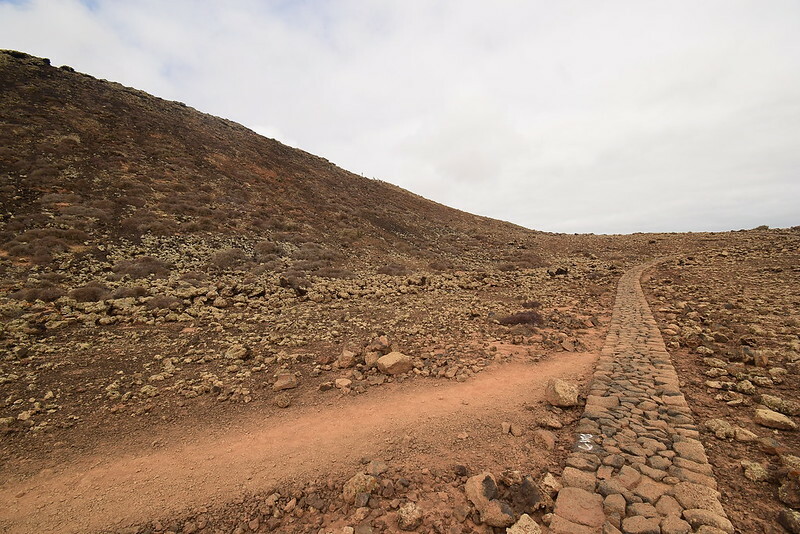 Not as easy to traverse as it looks! 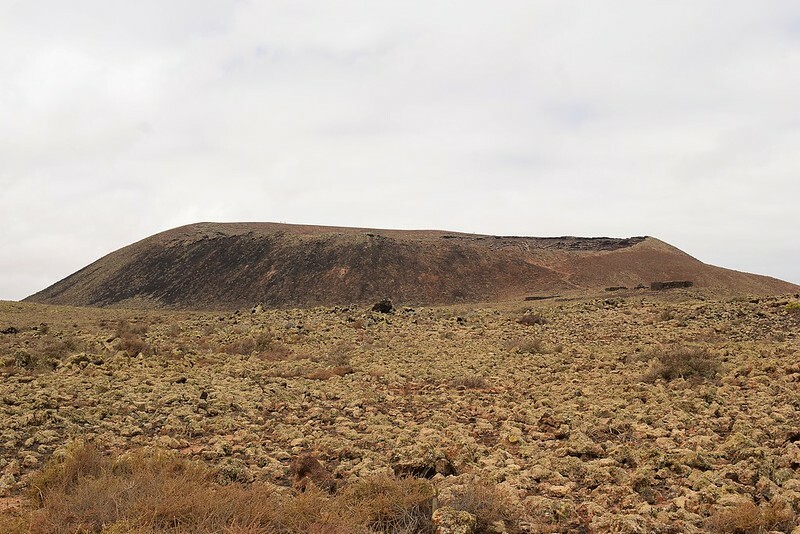 As I approach the western crater of Bayuyo I see people and hear another commotion... something is up, surely they don't drive up here to cheer on anyone climbing Bayuyo?! 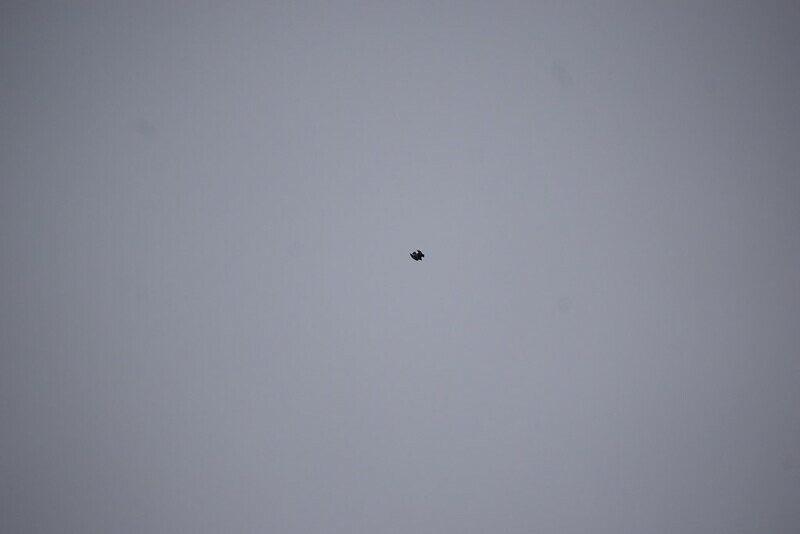 Haha now it all makes sense, it's the wee guys again keeping everyone entertained!! 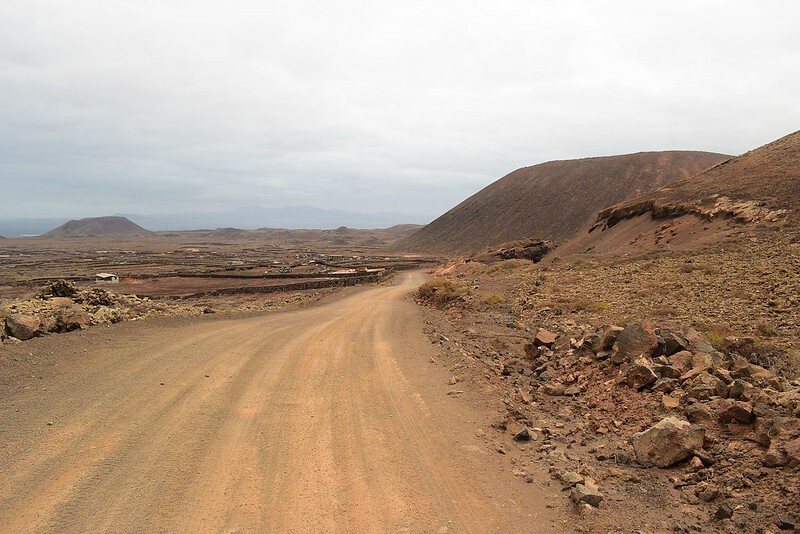 It's a fair trek back into town, not as scenic lower down but much easier going until some passing cars throw up a dust storm! 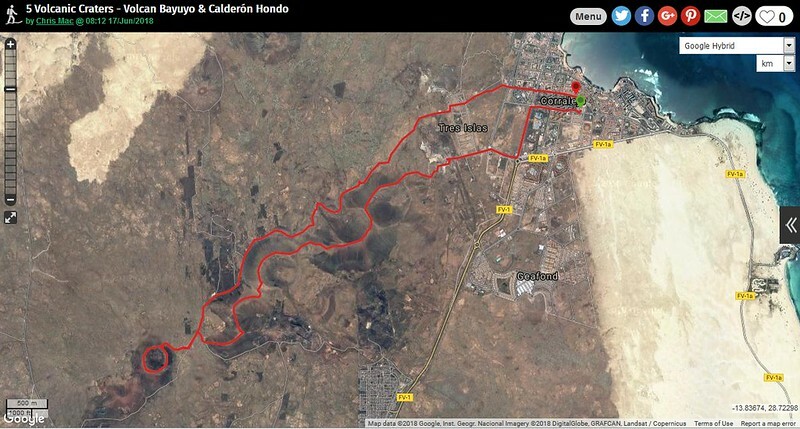 I'm soon back in town and then it's just a long straight back to the apartments and refreshing shower. 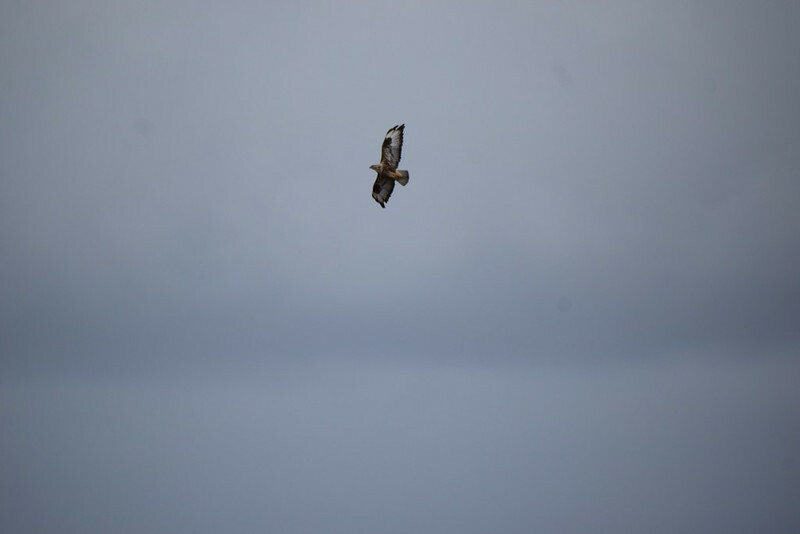 I'd also enjoy an amazing meal that night to refuel with, Single Fin Burger place, top notch!